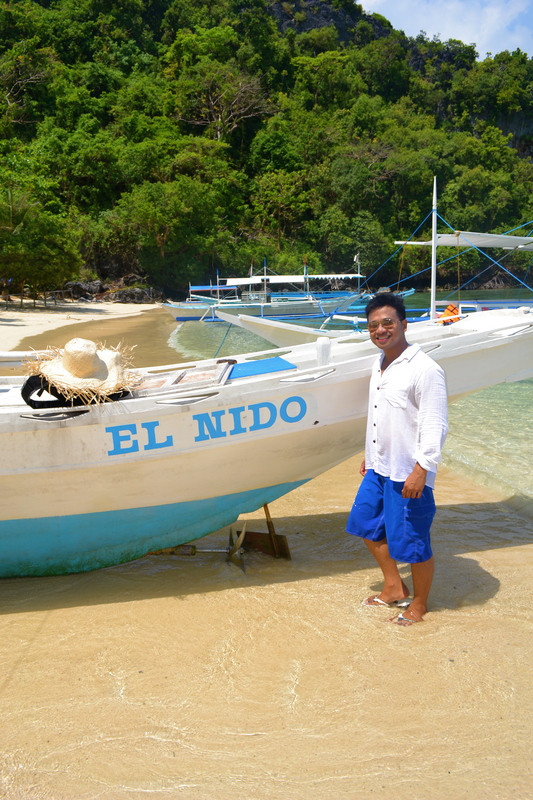 El Nido is Spanish for “the nest”. 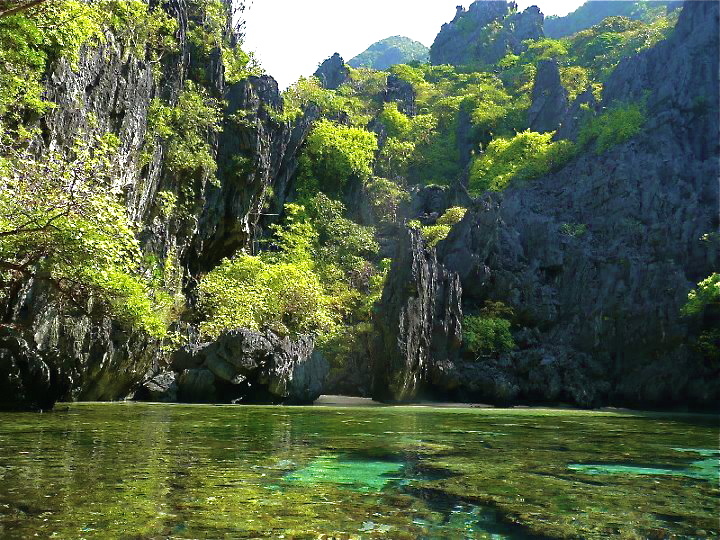 The out of this world area of awesome natural wonders is located in the northern part of Palawan, considered as the Philippines’ last frontier. 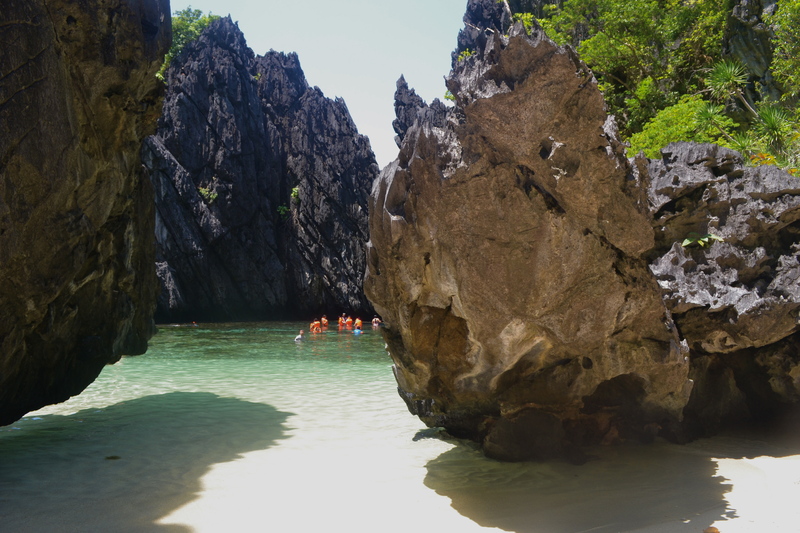 Palawan is also the place where you can find the Puerto Princesa Underground River (PPUR), one of the New 7 Wonders of Nature. 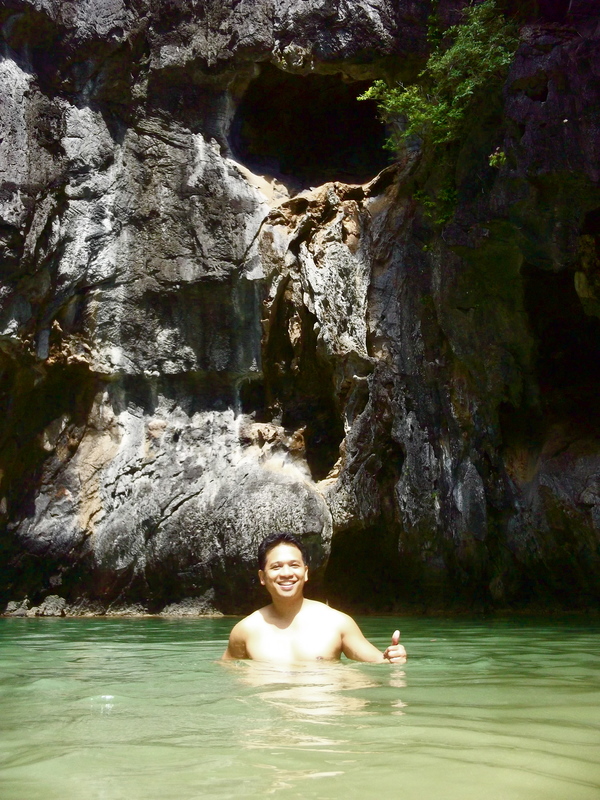 I have only started exploring the island province at the start of year 2012 with a carefully planned visit to Coron and its outlying islands off the northernmost tip of Palawan. 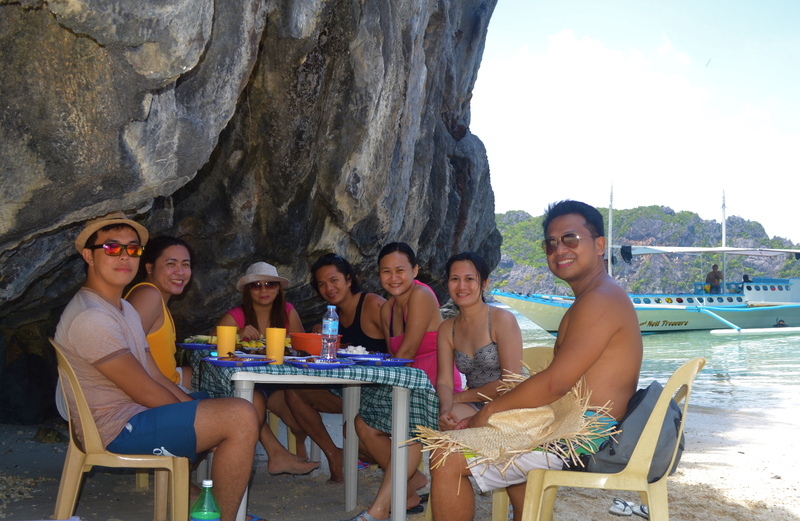 Four months after my Coron trip, the El Nido trip was planned. 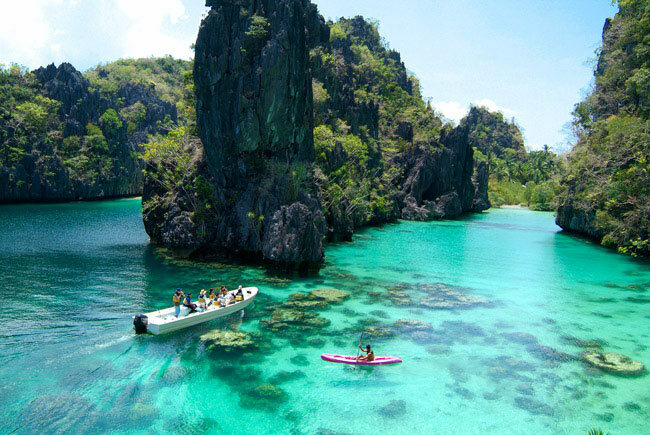 The Philippine populace has the impression of El Nido as an expensive hideaway only affordable by the affluent locals and dollar-toting foreigners. 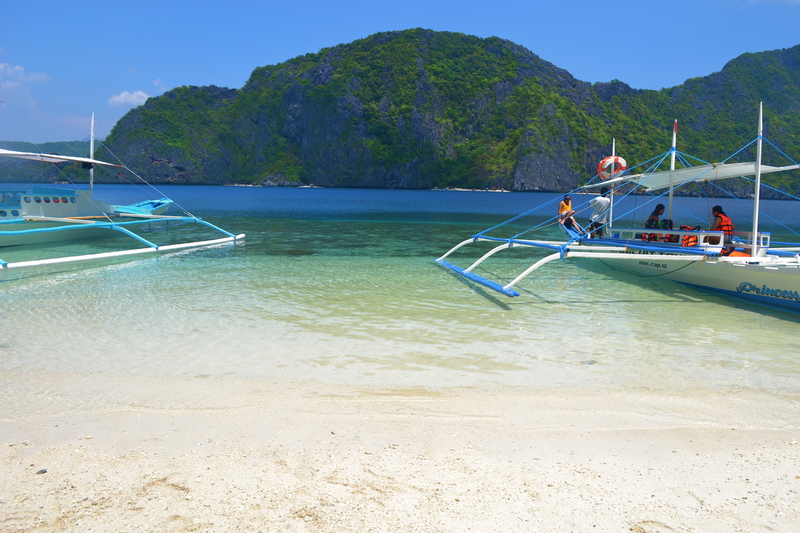 Yes, it would be more expensive if you would take the chartered flight from Manila direct to El Nido’s tiny airport (~Php 14,000 two-way) coupled with a few days stay at one of El Nido Resorts’ stunning properties (starting from US$200-300 per night). 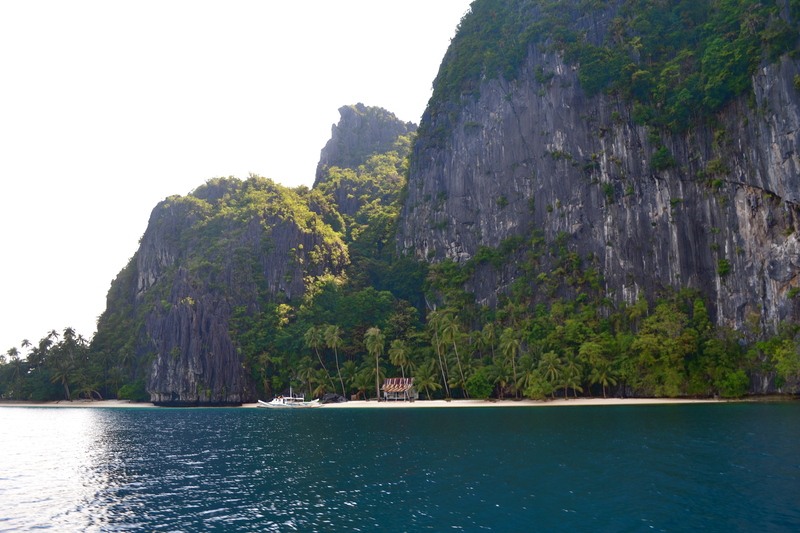 However, I personally discovered that the expensive impression of El Nido was absolutely wrong. 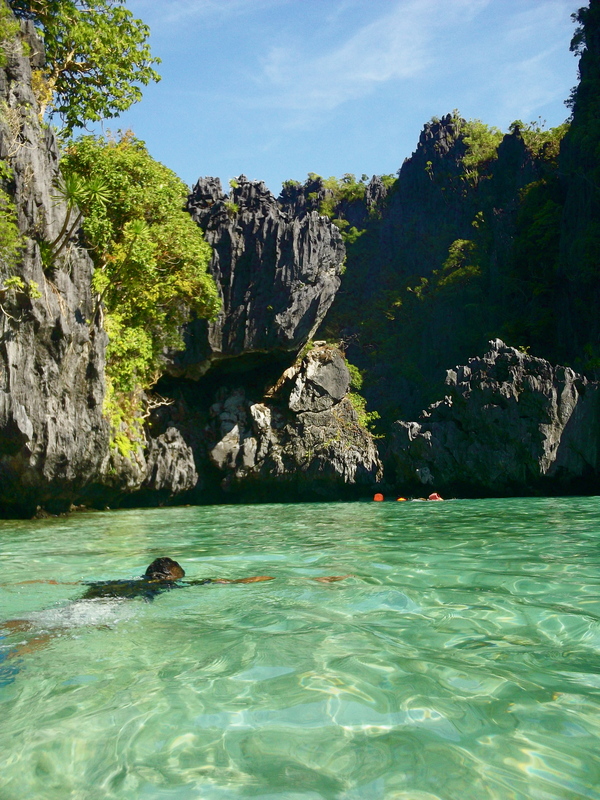 There is indeed a cheaper alternative to enjoy El Nido. 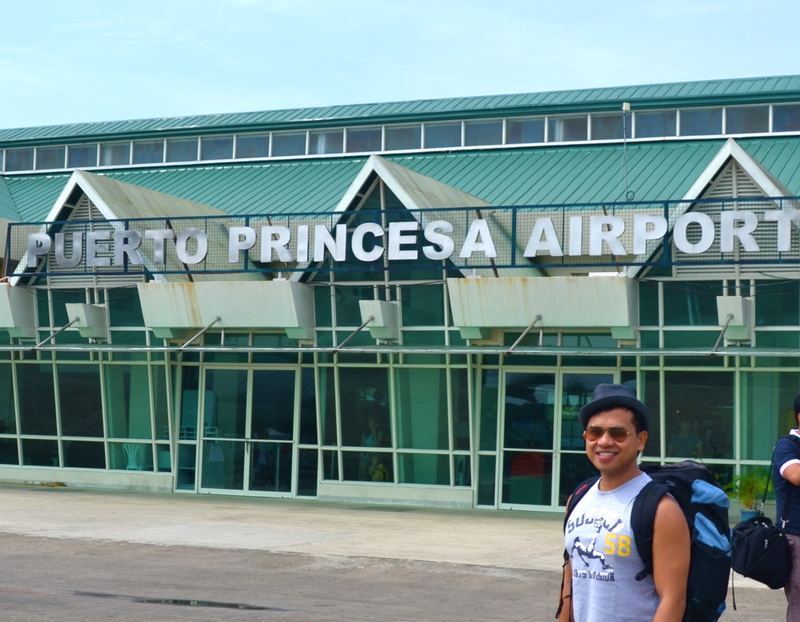 I took a flight from Manila to Puerto Princesa, Palawan’s capital city and stayed overnight at a hotel just near the airport. 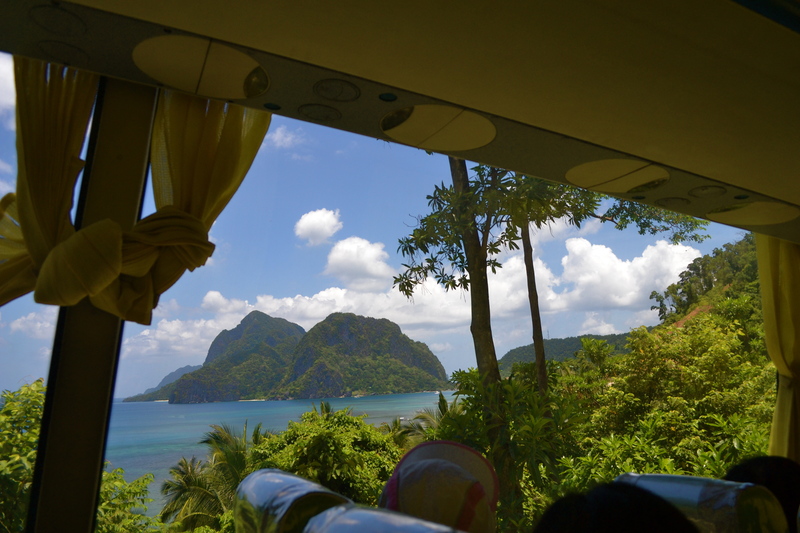 The following day my friends and I took the 6am air-conditioned “RORO” bus from Puerto Princesa’s San Jose Terminal to El Nido. We enjoyed stunning views on mostly paved but at times harrowing roads all throughout the trip. 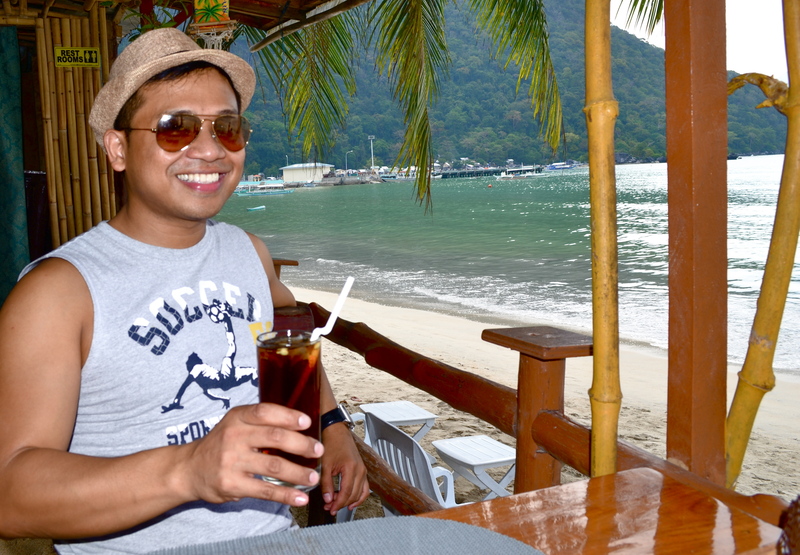 We reached El Nido 6 hours after we left Puerto Princesa, around lunch time. 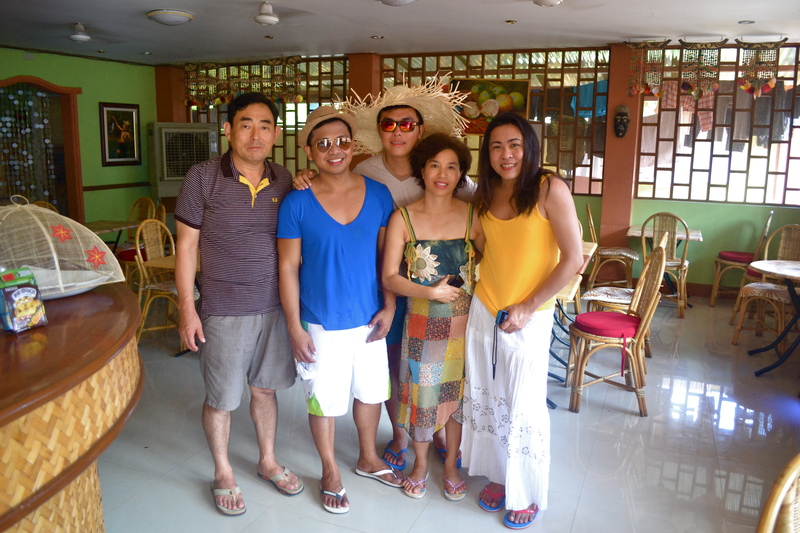 We were in the company of a Korean couple studying English near Puerto Princesa who were to spend a few days in El Nido. 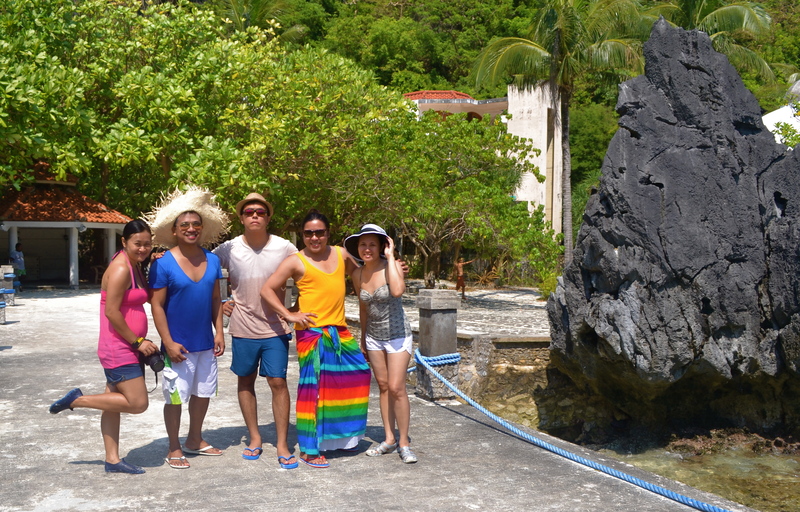 We all checked in to the same homey place called Lolo Oyong’s Pensione House. 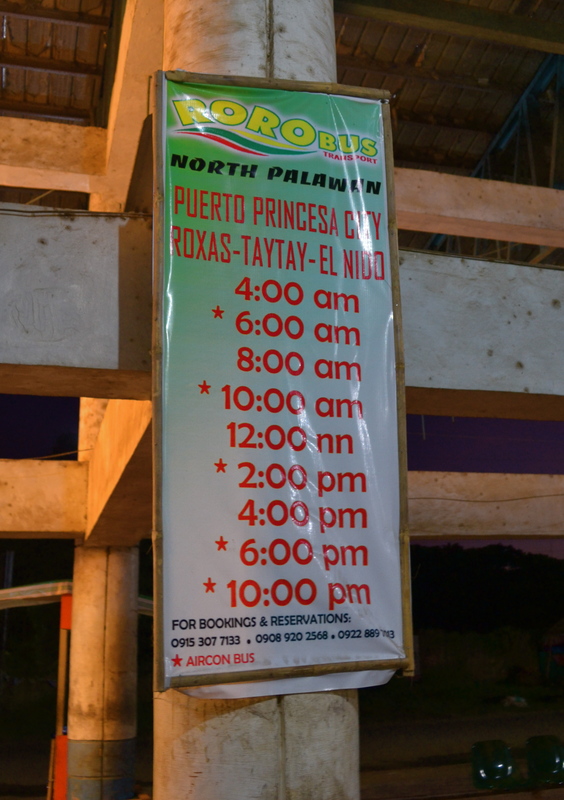 It was charging a room for 1800 pesos for 2 persons and 2200 pesos for 3 persons, breakfast included. 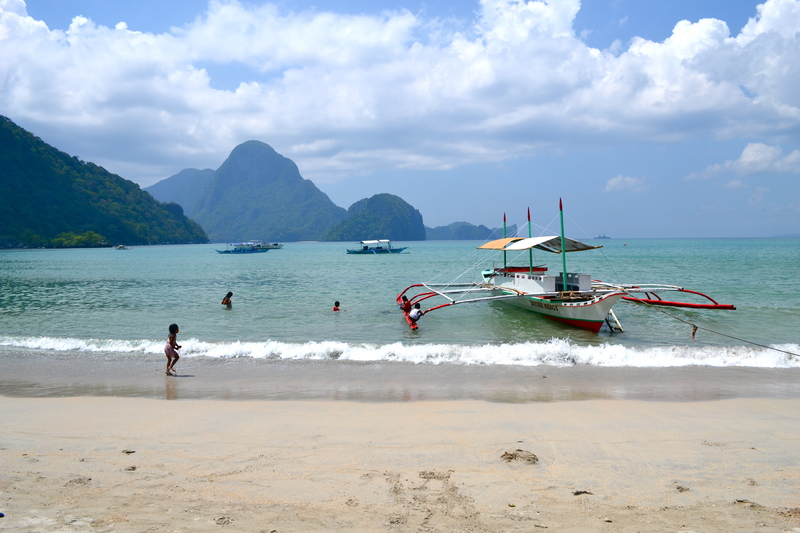 Under the searing heat of the mid day sun we walked two blocks from the hotel to the beach side or “aplaya” in local dialect. 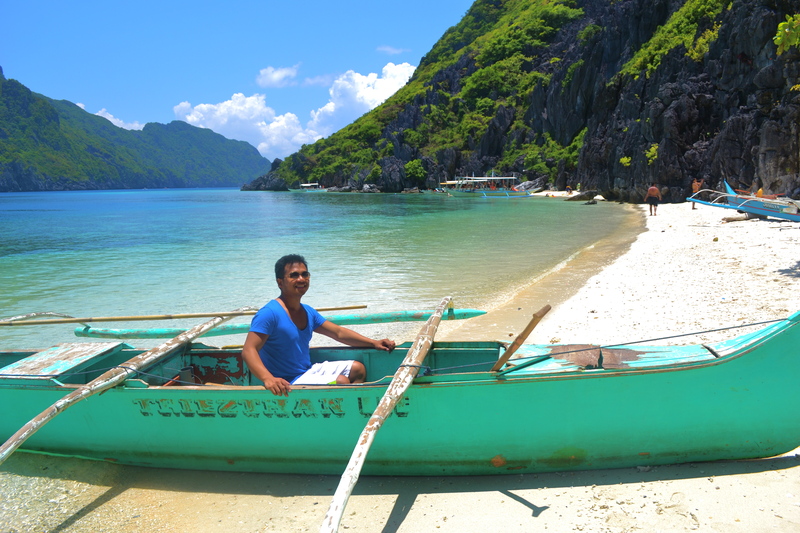 This is where boats would dock and fetch tourists going for the stunning island tours. 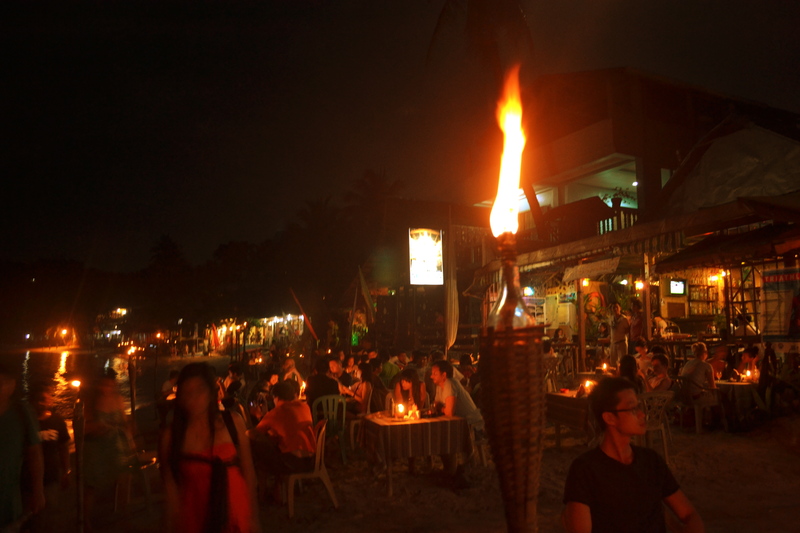 We positioned ourselves at the edge of the Aplaya Bar & Restaurant…. 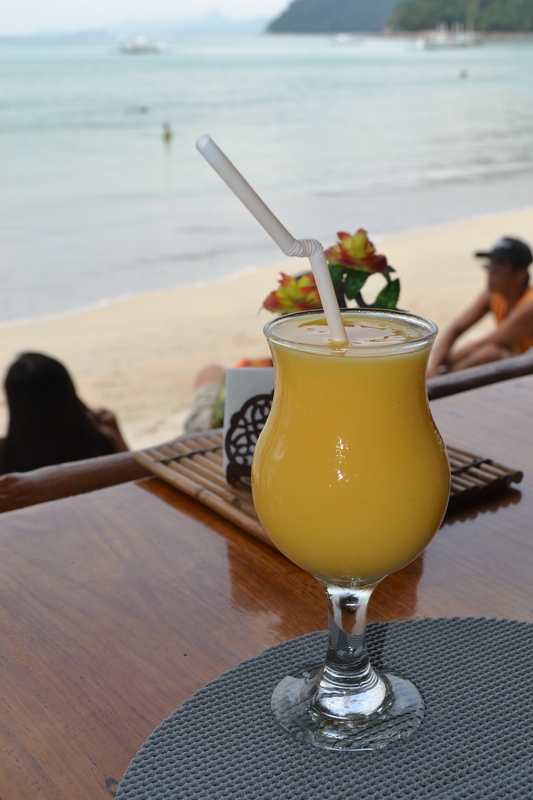 …just to have the relaxing view of the beach. After we had our sumptuous lunch, we had some cocktails and just spent the day lazily on this spot. 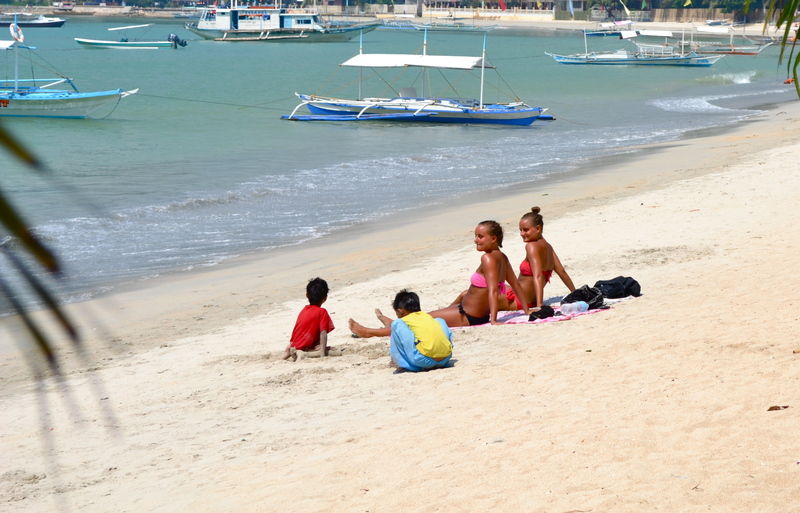 Some tourists from Europe were just simply lazing on the beach interacting with local children…..
We also enjoyed the sweetest mango shake in the world, one that’s made of the world famous Philippine mangoes. We went back to our hotel to rest and catch some sleep. 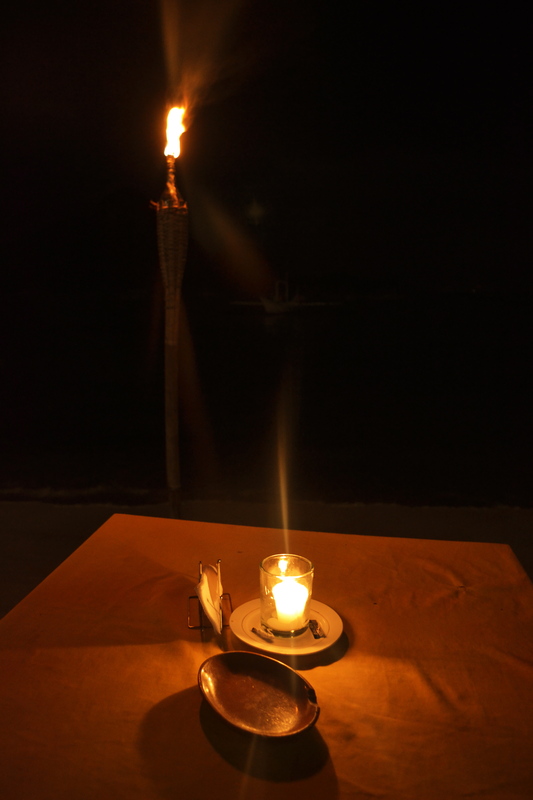 After we woke up, we had dinner at the beach side with all the romantic candlelights and torch fires. 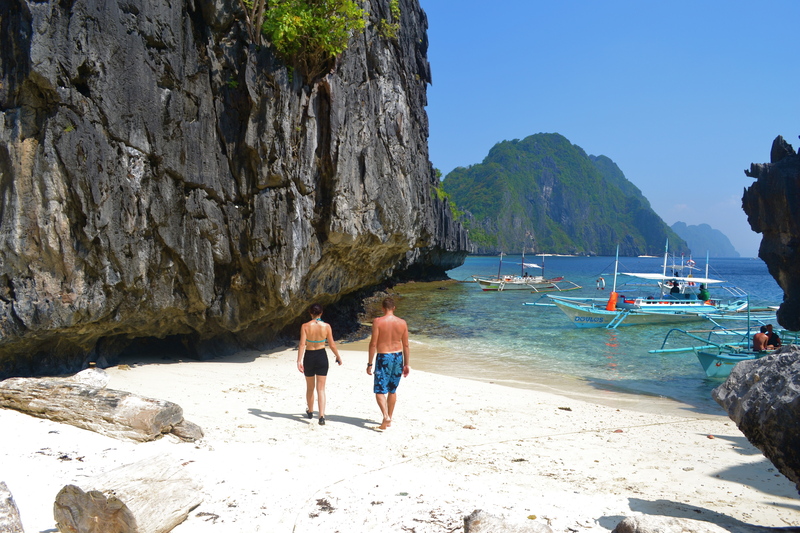 Afterwards we explored the nearby places and went back to our hotel with the next day’s island tour in our minds. 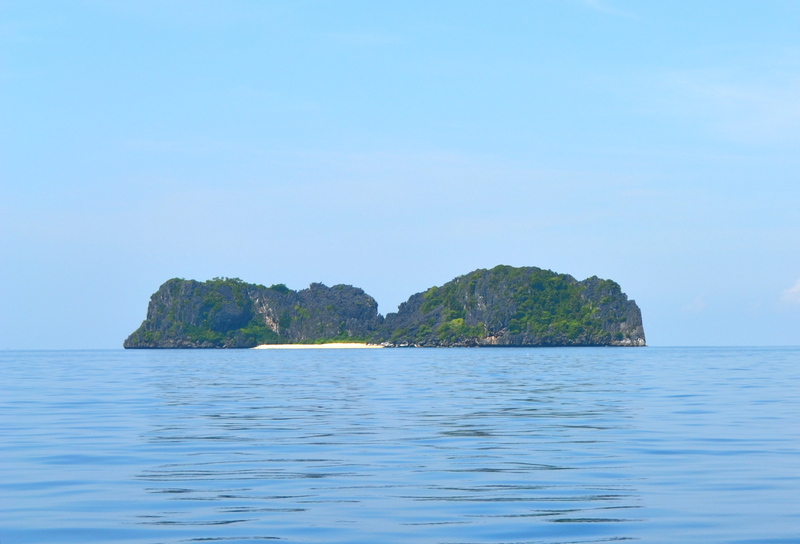 The following day was perfectly sunny and we were on to our first island tour. 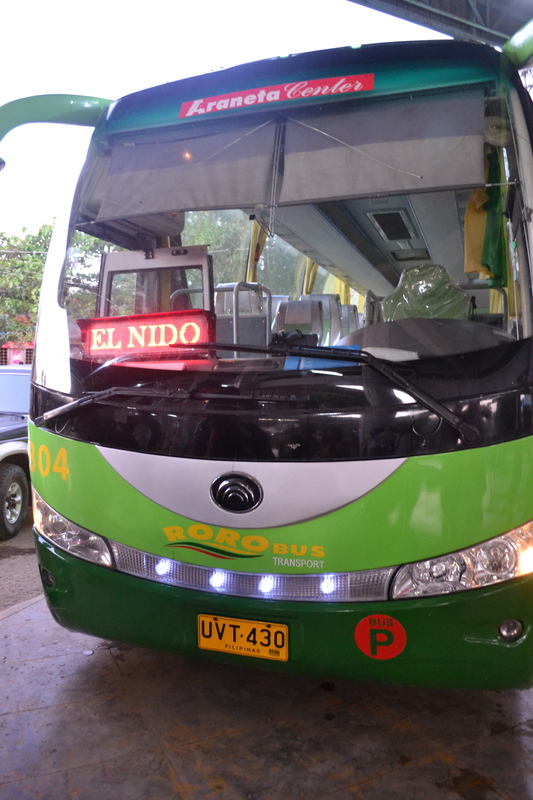 There are four tours being offered by operators namely A, B, C & D. Each tour, ranging from 700-900 pesos per person, would take a full day. 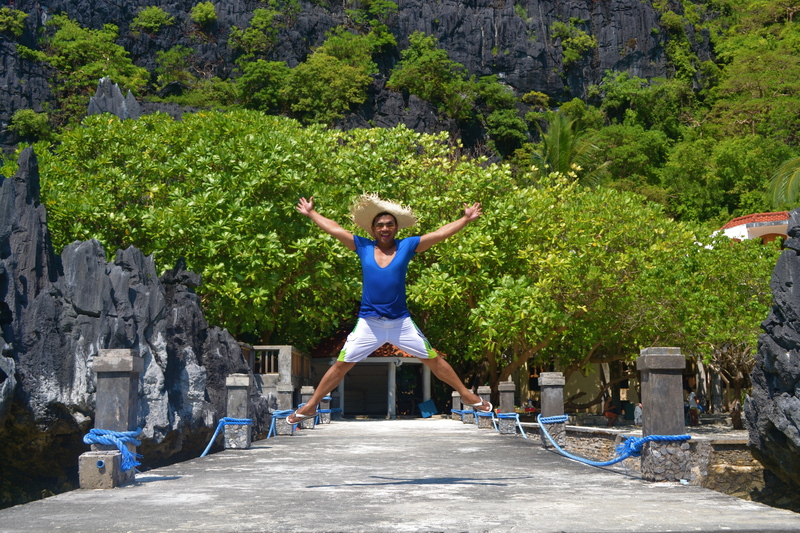 However, we combined two tours in one day due to our limited stay in El Nido. This had the drawback of missing some of the itineraries of the tours. 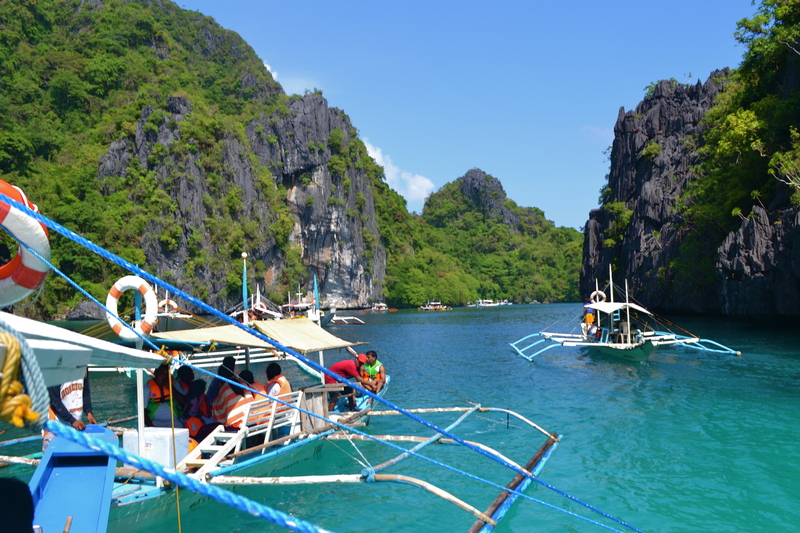 You have to carefully select the particular sights you will visit and make an agreement with the boatman and tour operator what places you will skip if you opt for a combination. 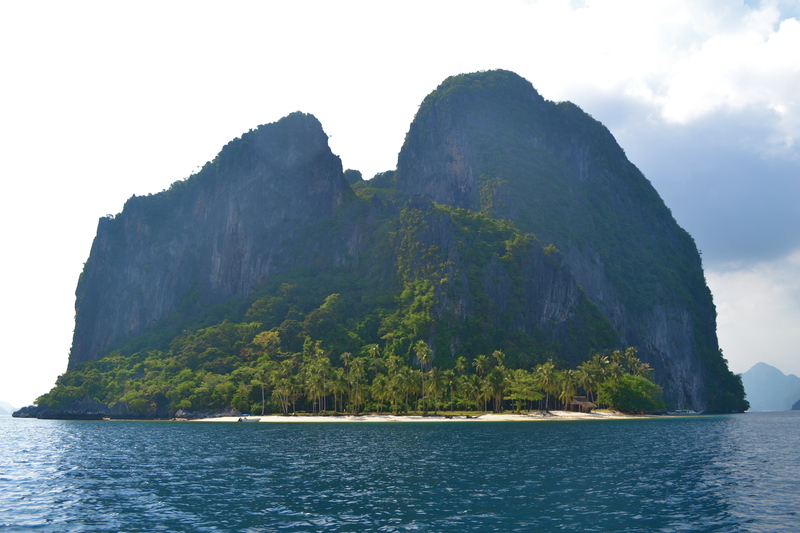 The first island that came into view was the largest of them all in Bacuit Bay, the mystical Cadlao Island. 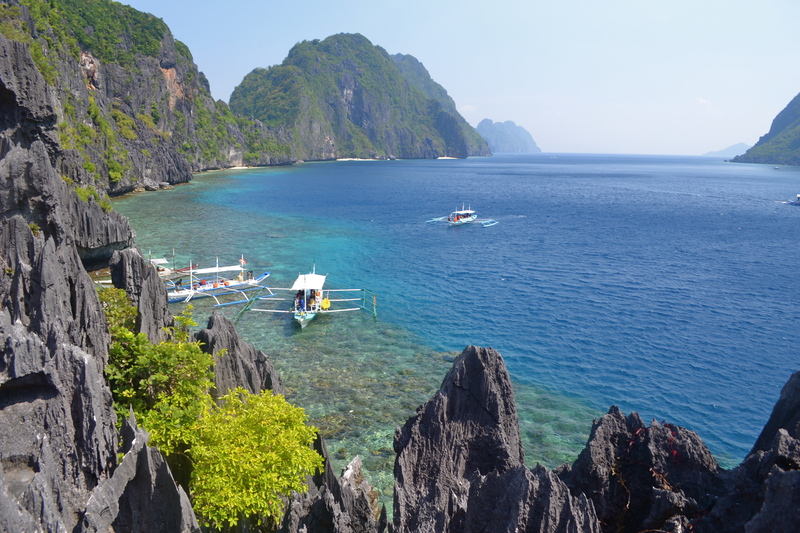 But this would not be one of our destinations on this day as we would visit Cadlao on our last day. 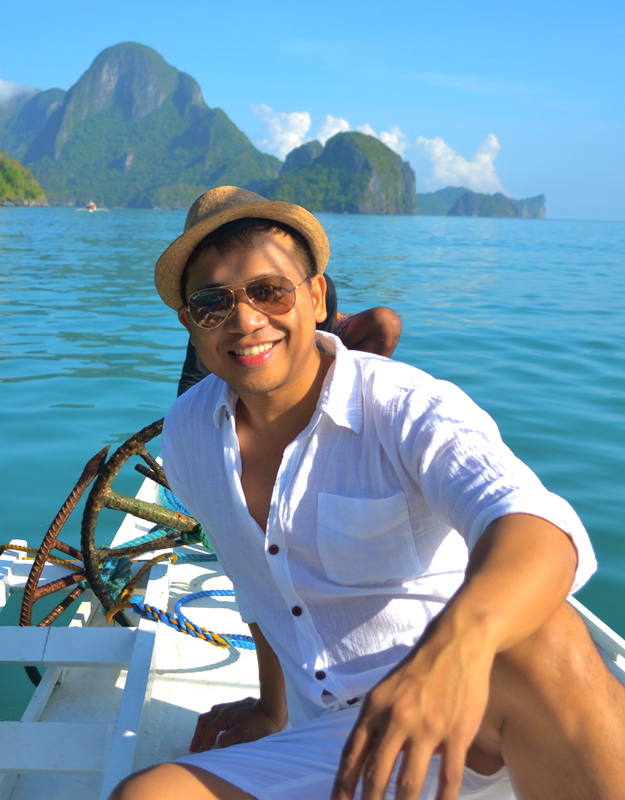 I was in a perfect, jolly mood to tour the famed El Nido! 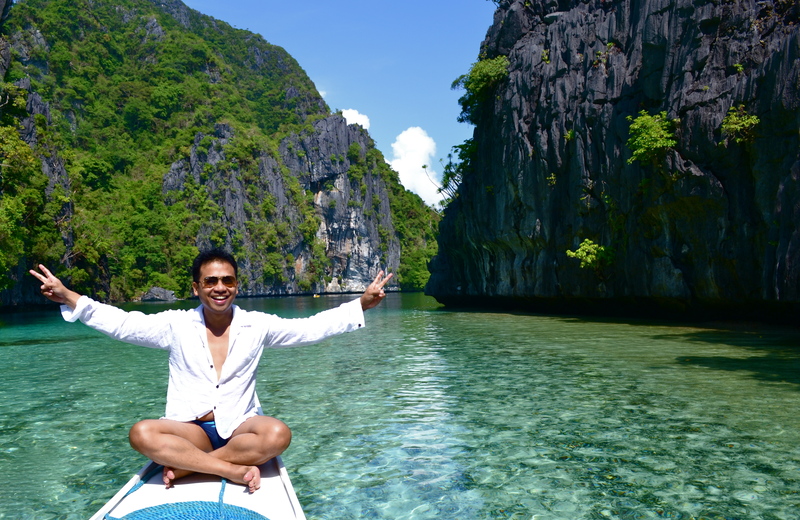 Our first stop would be the Small Lagoon just behind those karst formations. As we drew closer, I became ecstatic! 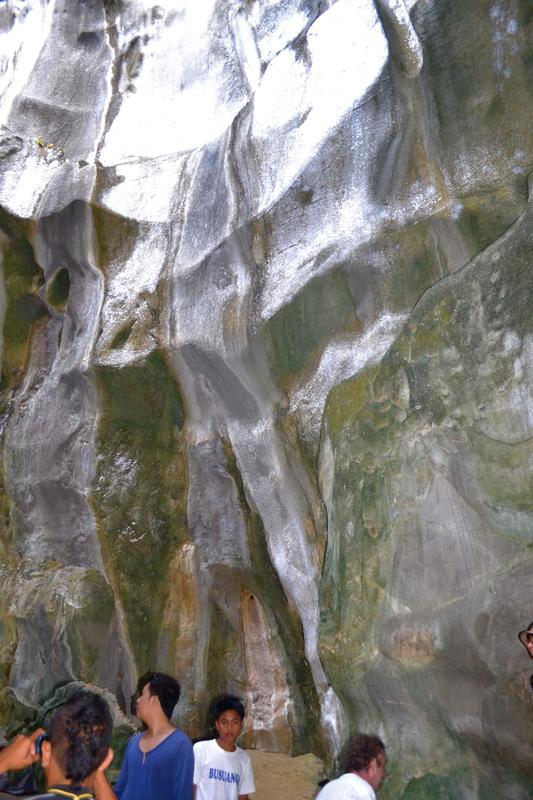 We arrived at a cove enclosed by rock formations. 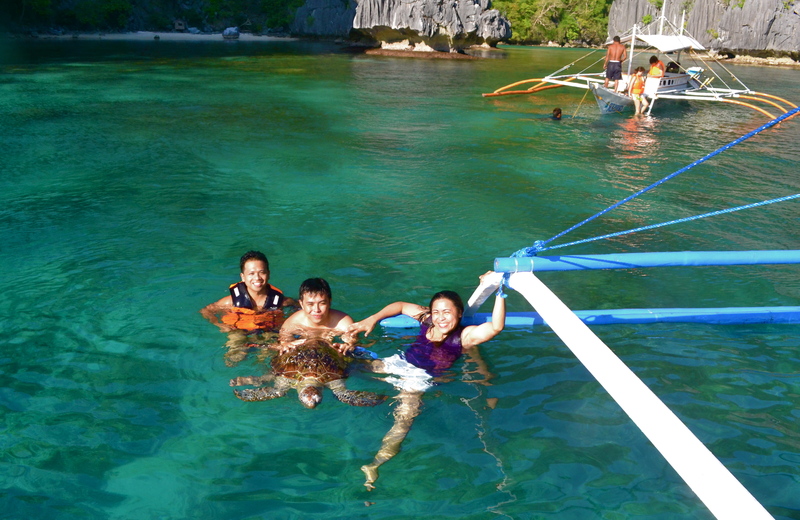 The water at the entrance to the Small Lagoon was crystal clear and we got off the boat and swam to the small opening. 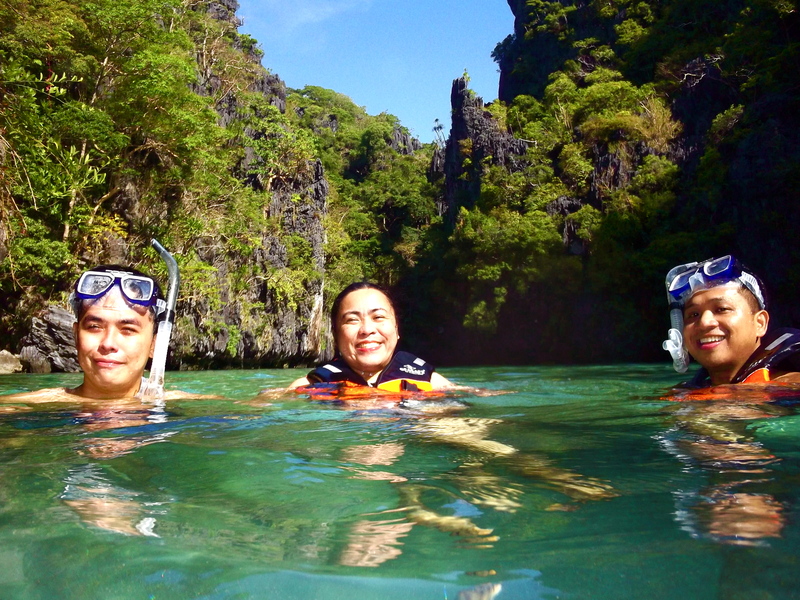 These are my travel buddies, Raffy, a local of Palawan and Thannya from Cebu. 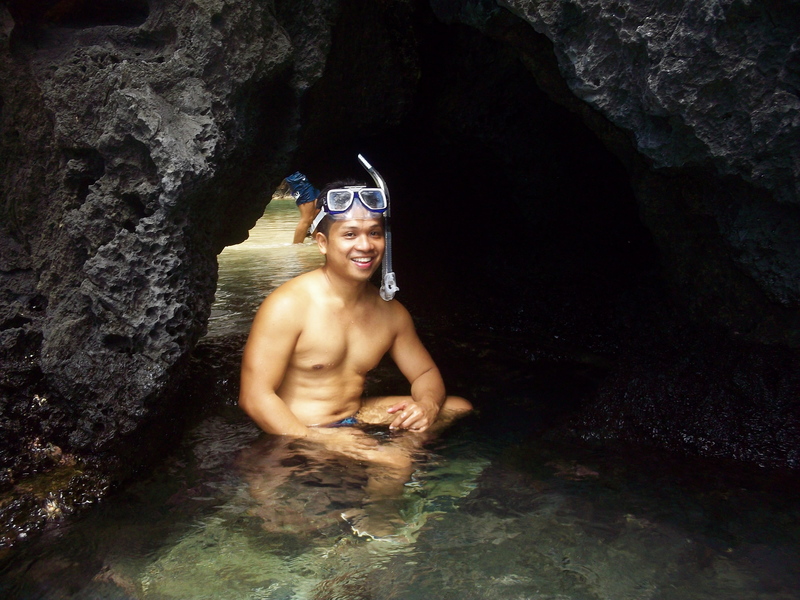 We swam across the Small Lagoon and entered into a small cave which was the highlight of the Small Lagoon trip. 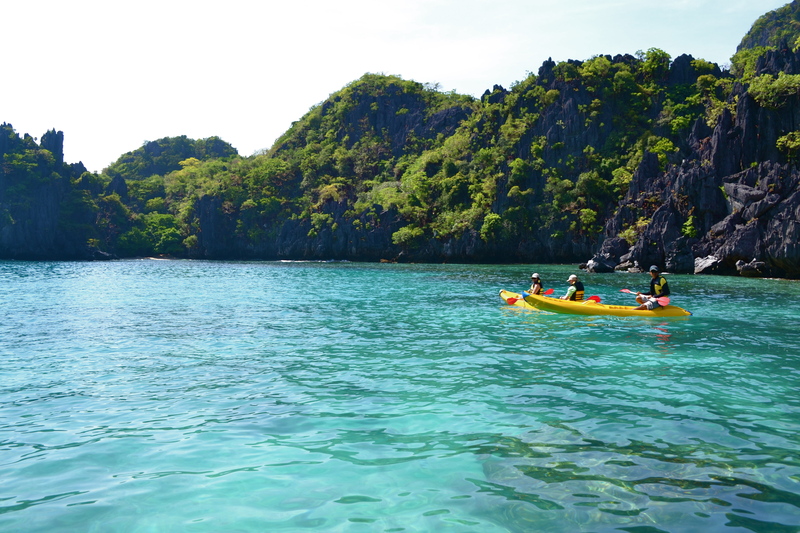 We left Small Lagoon en route to the Big Lagoon passing by the aquamarine waters with some guests from nearby El Nido Resorts on board the signature yellow kayaks. 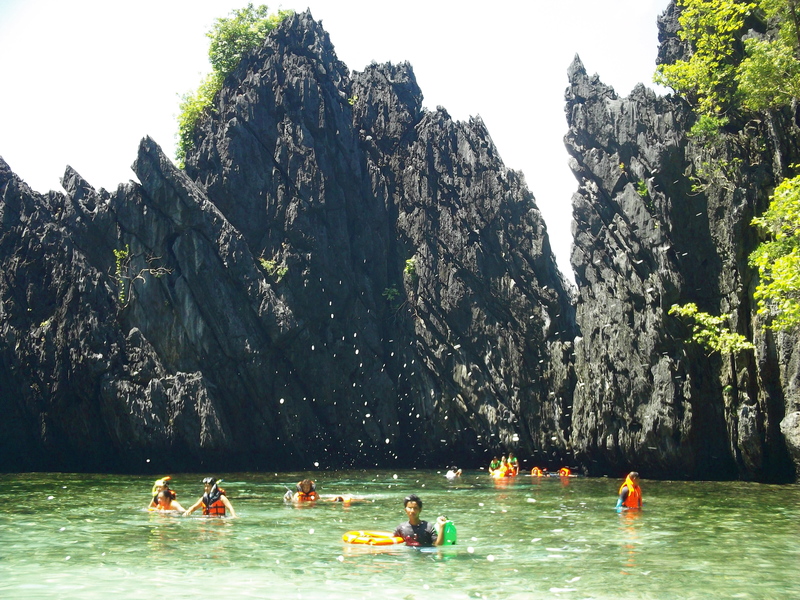 Entering the Big Lagoon was overwhelming. 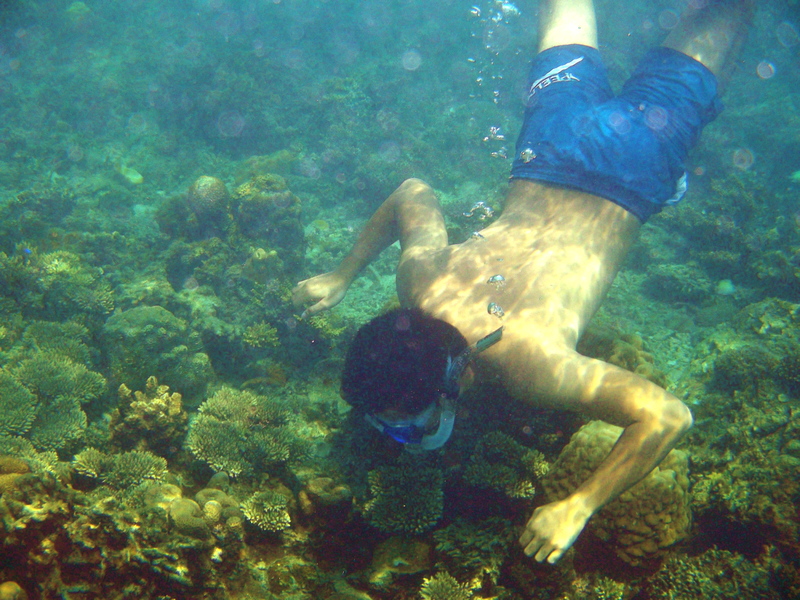 The water was free of any rubbish and was amazingly clear. We would traverse the waterway to just tour around the area. 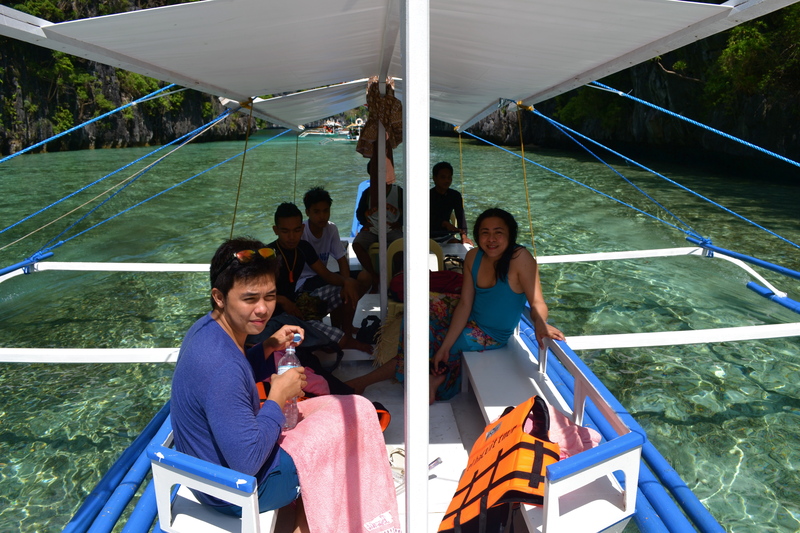 To save time we would not get off the boat to snorkel. 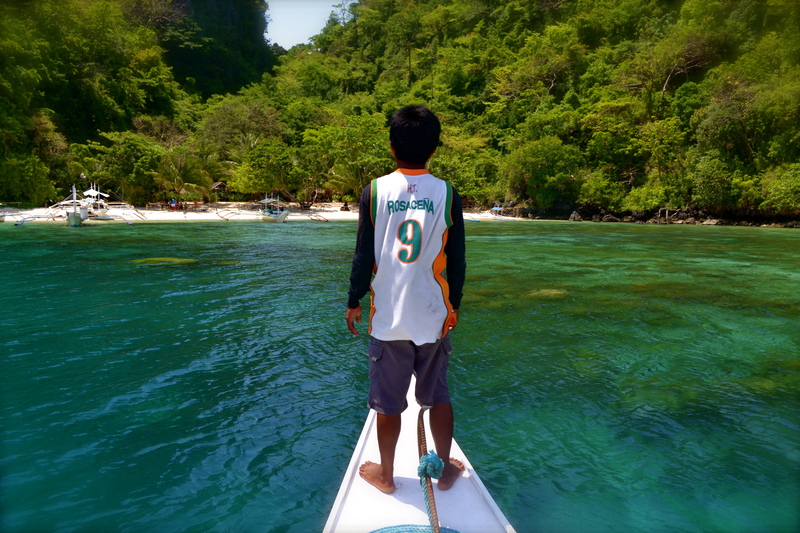 The shallow clear waters were inviting but no one was allowed to get off the boat. 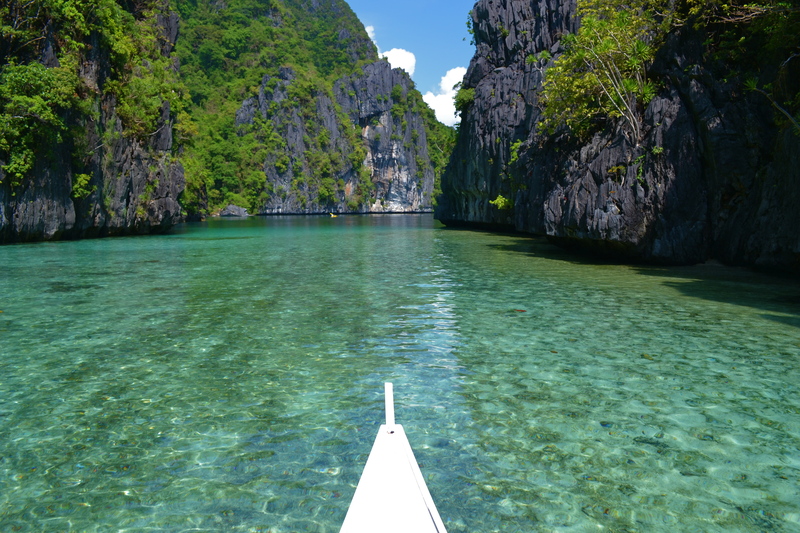 The waterway was only passable one way during low tide as other parts are impassable as the boats would touch the corals and rocks beneath the waters. 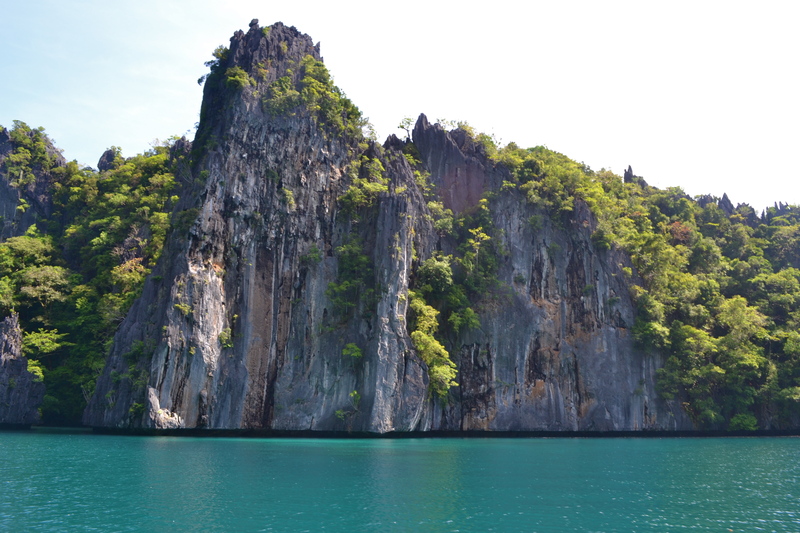 We waited for about 10 minutes before we could get out of the lagoon into…..
We passed by more stunning sights around the bay. 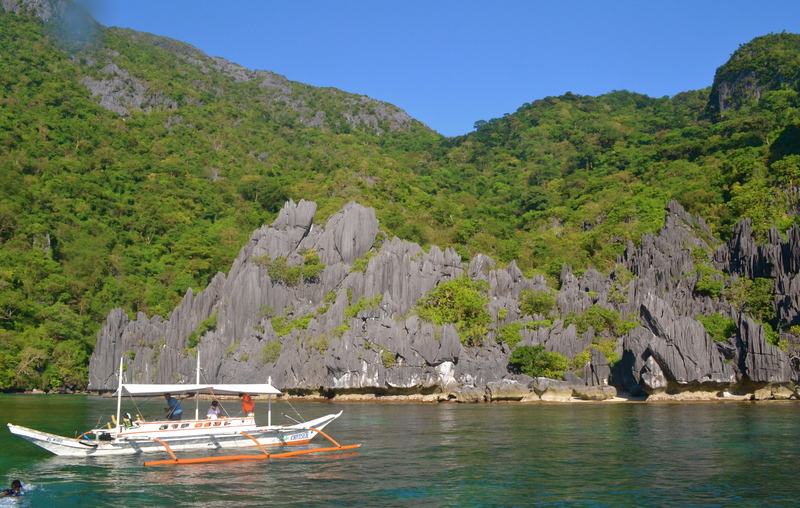 One of them was the former tribal council of Survivor U.S.A.
Other sights would be the most common sceneries in El Nido: towering limestone karst formations with strips of tiny beaches beneath them. 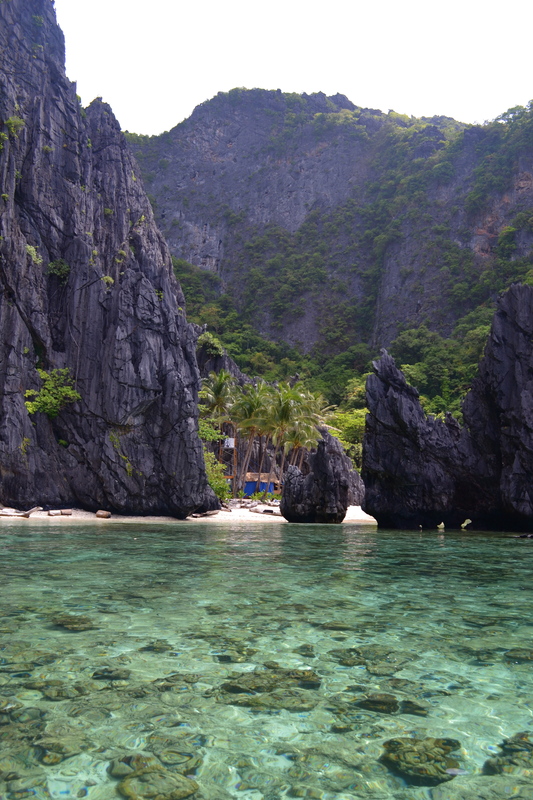 Our next destination would be Secret Lagoon. Secret Lagoon is located next to a secluded area that was occupied by Survivor Sweden. 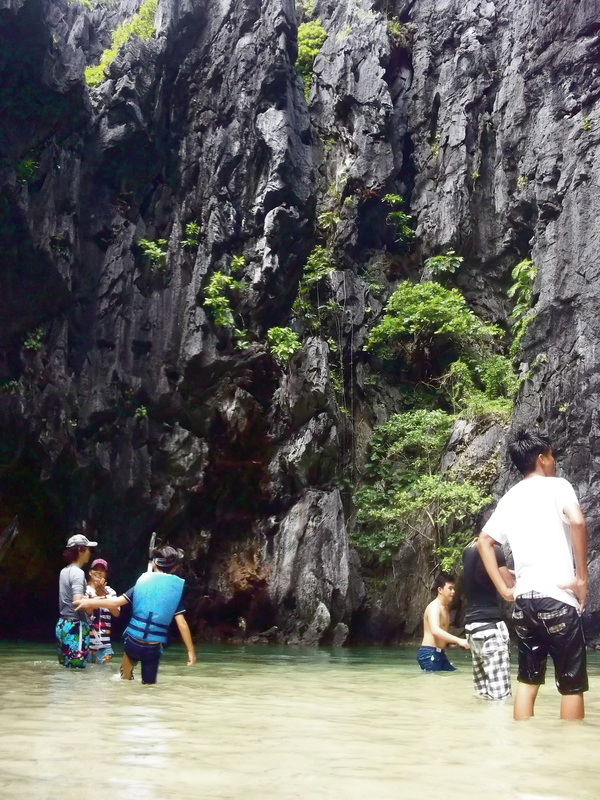 White sand beaches and karst formations again! The lagoon has been dubbed “secret” as one would need to swim through a small opening to get inside it. 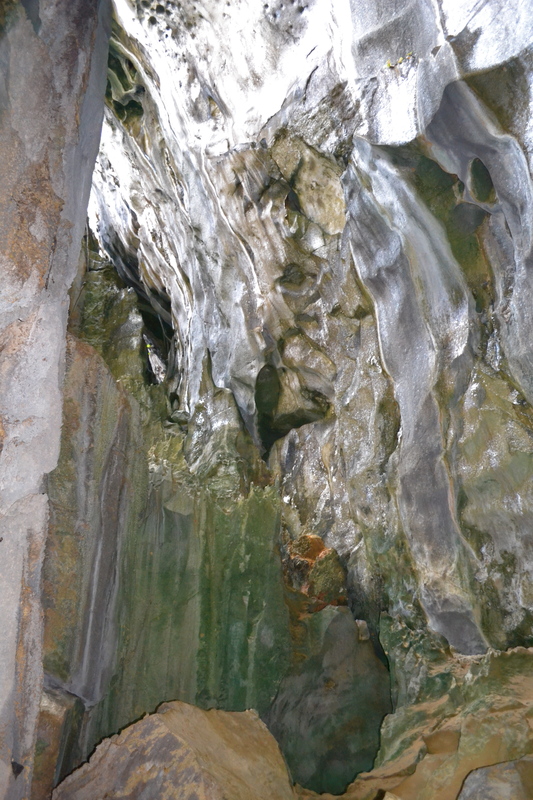 Entering the narrow opening, I carelessly stepped unto a slippery stone with a sharp rock cutting my left knee. It was just a minor cut that bothered me a little later after the boatman treated the wound with a medication for it to dry fast. 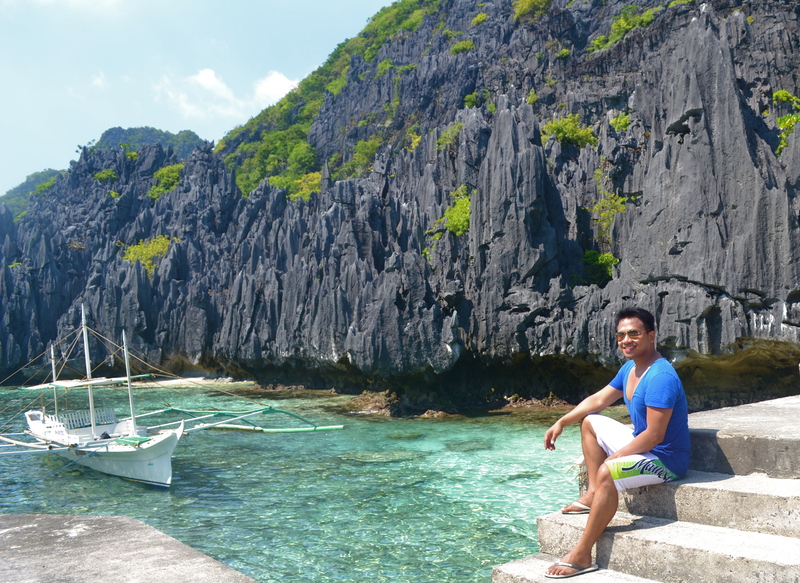 Inside it was a small lagoon that is enclosed by towering limestones. 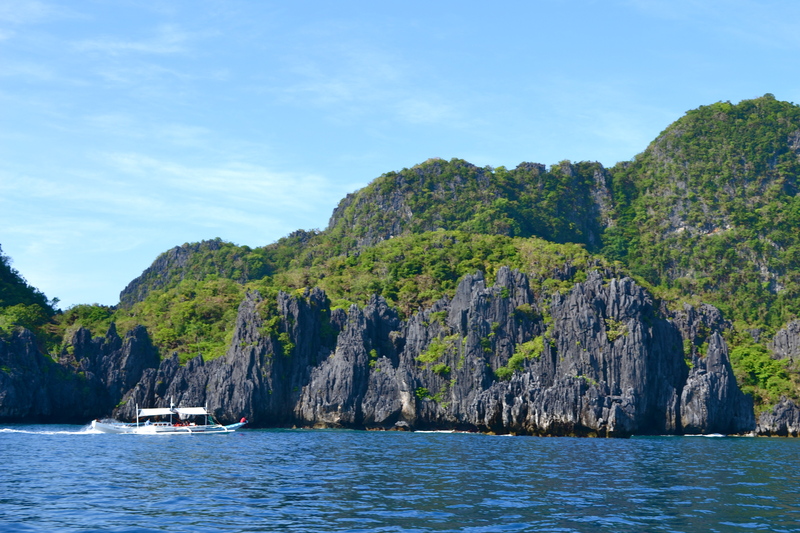 I could not get the whole view of the lagoon and the limestones as I only had my waterproof camera in tow inside the lagoon leaving my better D-SLR inside the boat. We stayed for about 5 minutes and then we left for our next destination, the unique Snake Island. 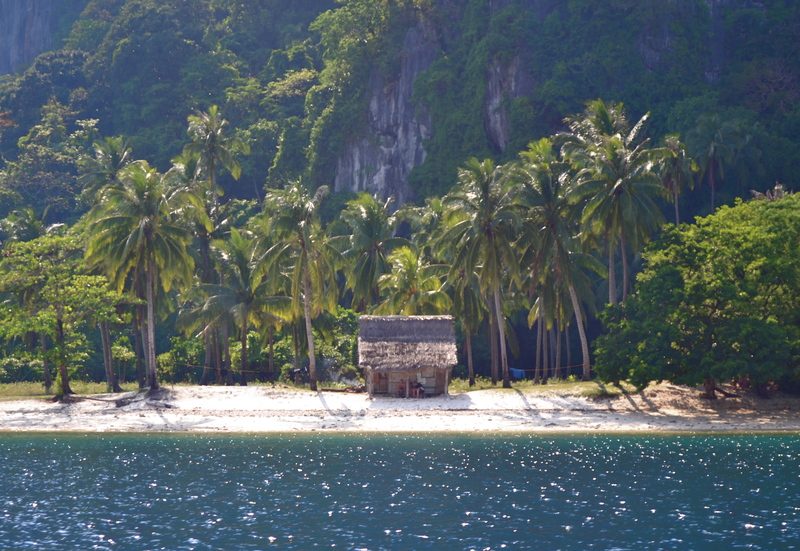 On our way to Snake Island, we passed by one of the prime properties of the private El Nido Resorts in Miniloc Island. 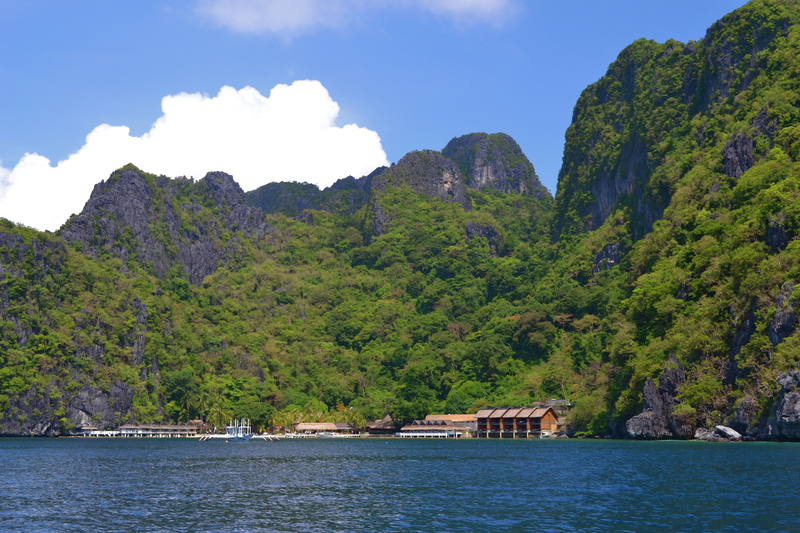 This would be the first of the 3 El Nido Resorts we would be passing by during the day. 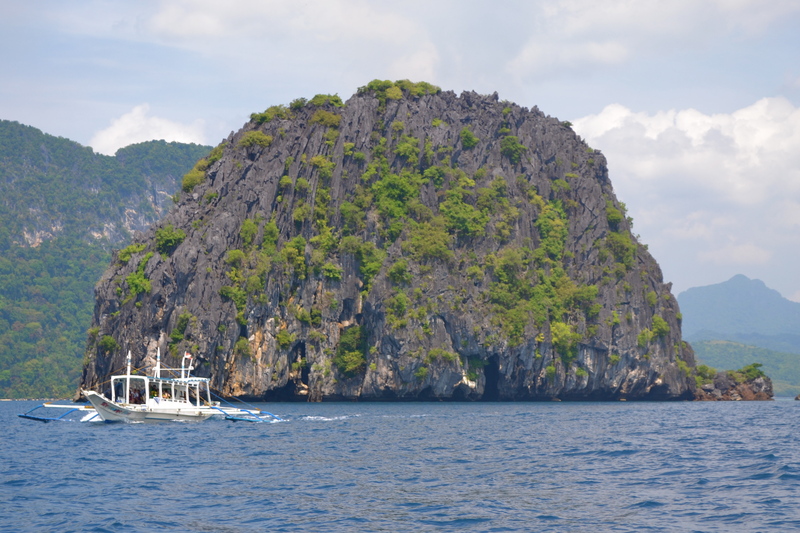 We also passed by Turtle Island that is now off limits to tourists. Before, turtle eggs have been regularly stolen by tourists visiting the island so the local government closed it to the public to protect the turtles. 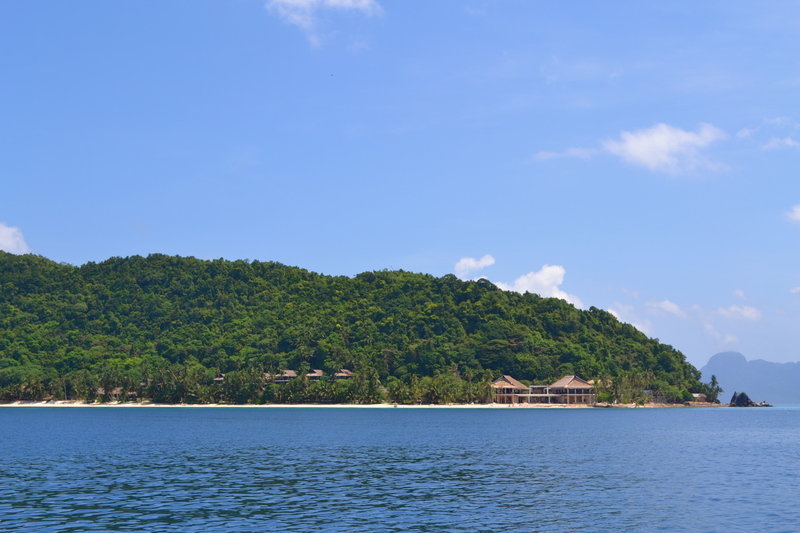 Before reaching Snake Island, we also saw another El Nido Resorts property in Pangulasian Island. 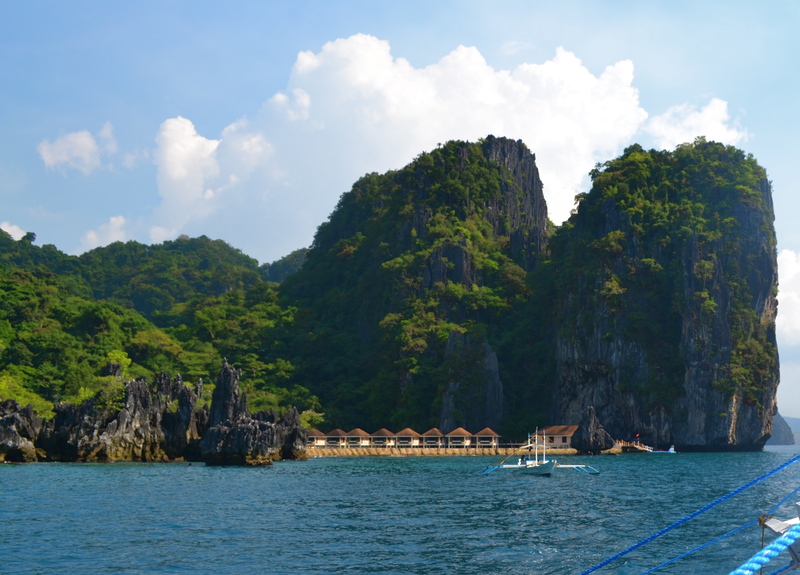 It was still being constructed after being burnt down the previous year to become the most expensive of all El Nido Resorts properties. 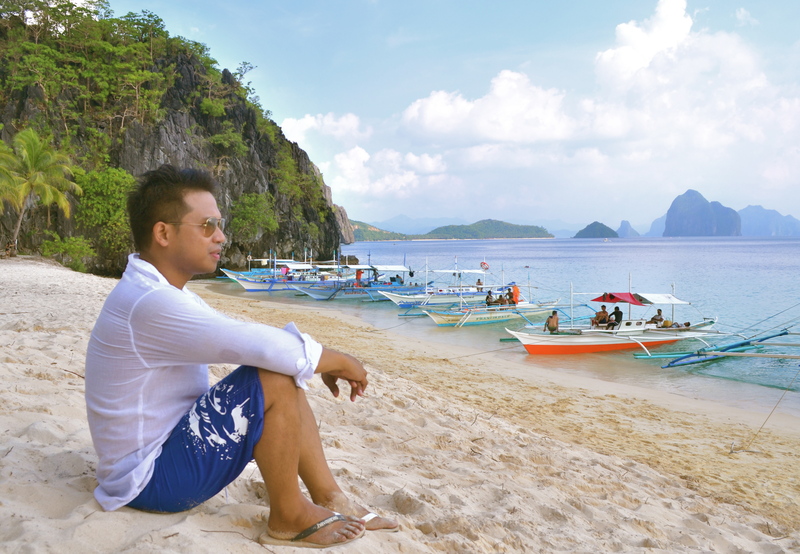 It also has the longest white sand beach of any El Nido Resorts. We arrived at Snake Island, again with so much enthusiasm on the unique island. 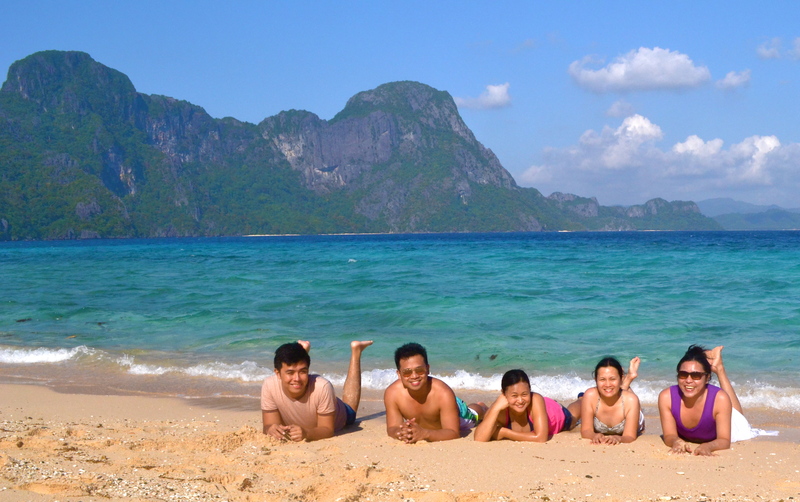 One of the most unique topographies in El Nido is Snake Island’s white sand beach that “crawls” and sways from one island to another depending on the tide. 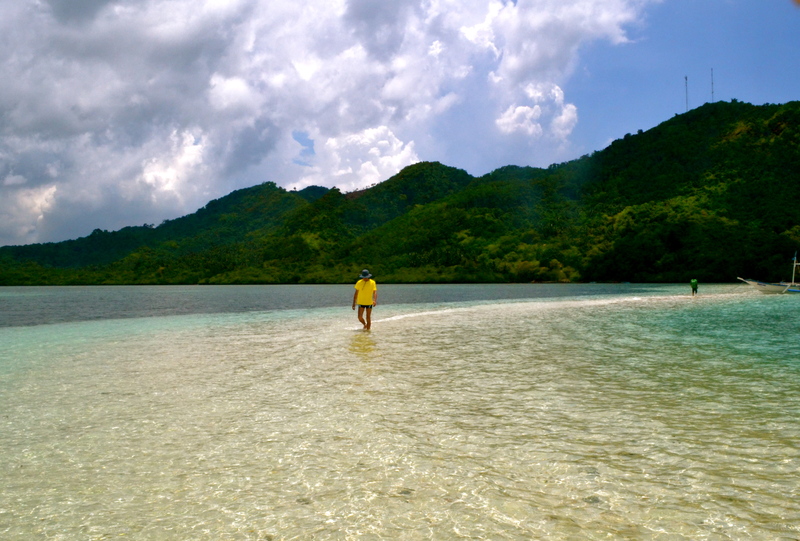 I have seen sand bars that go right from the island out into the open seas. This one seems to connect two islands. 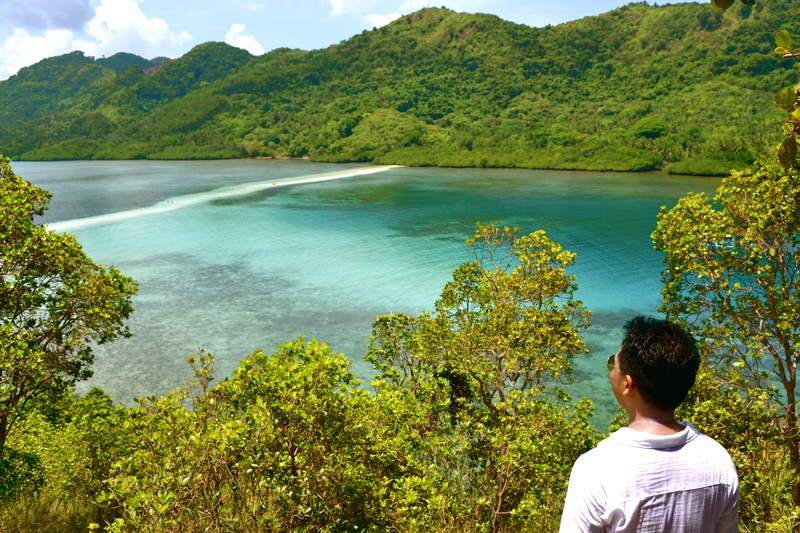 To get the best vantage point, we climbed up to the highest spot of the island to see its tail from above. It was amazing indeed! We stayed at the top as we watched the environment changed its mood…. oh well, with Instagram’s help. 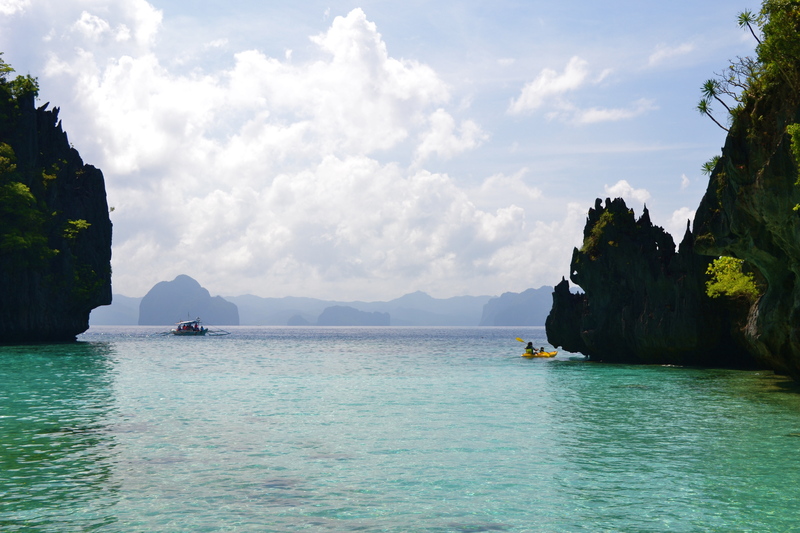 The view of the other side of the island was as magical as it could be. We stayed for about 30 minutes atop the cliff enjoying the breathtaking scenery. We went down in time for lunch. 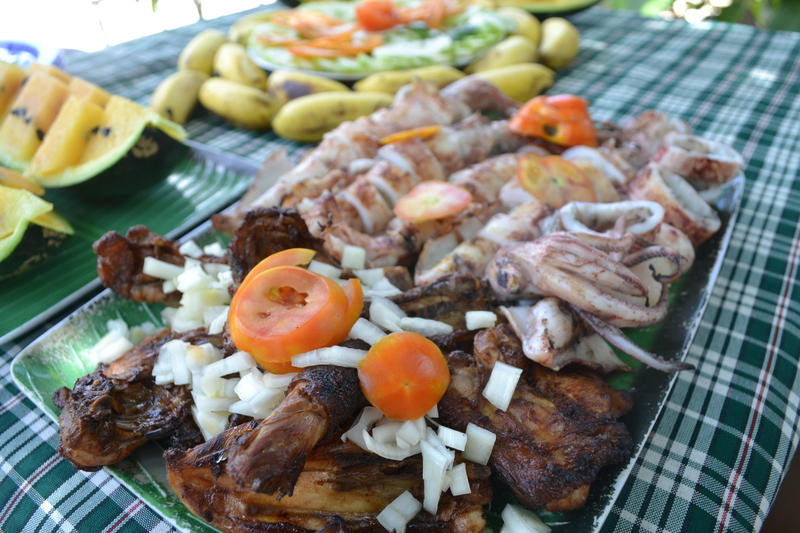 We had the food prepared by the boatmen as included in the tour package. 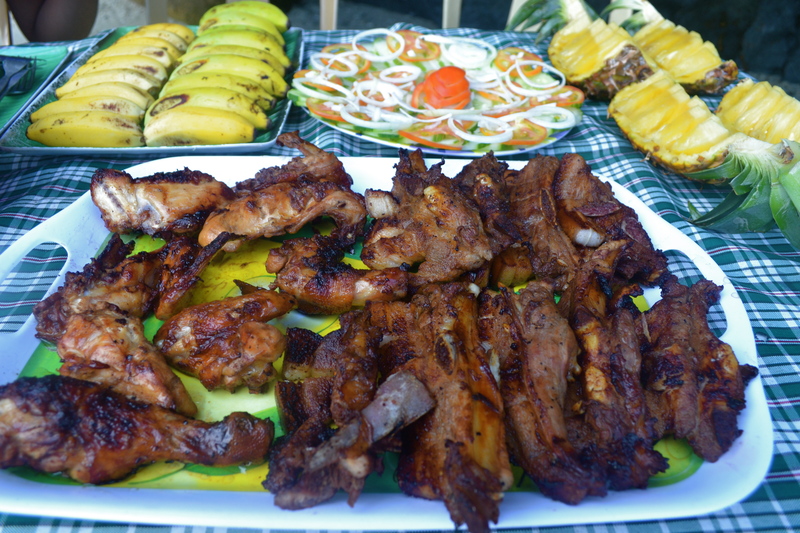 The food: fruits, grilled chicken and squid. Perfect! 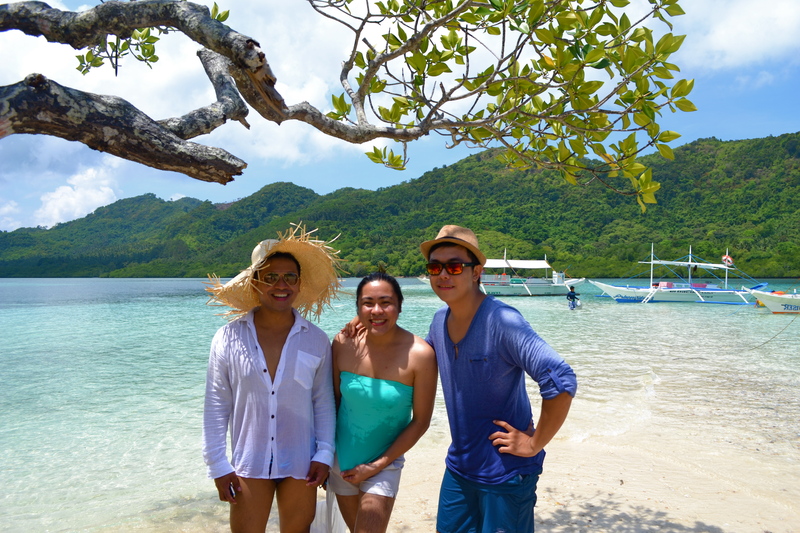 The three of us requested our boatman to take a pic of us on the “snake” beach. The “snake” could have been more visible if it was low tide but still you could see the “snake” trace even if it was submerged. 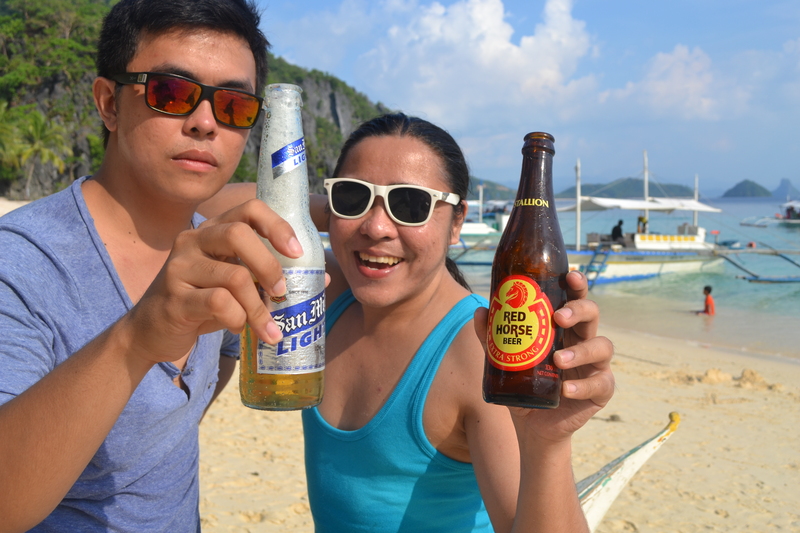 And I took a shot with somebody else traversing the “snake” beach. 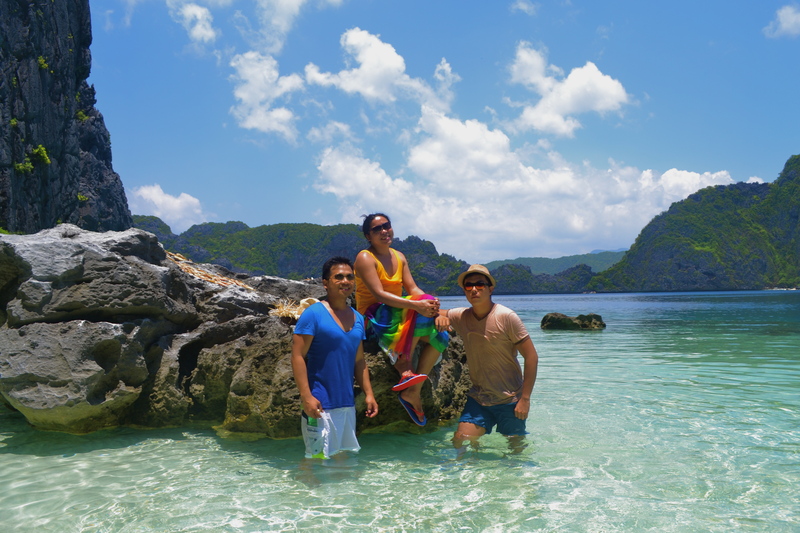 Afterwards, we just swam in the clear waters under the blazingly hot sun that I easily ignored as I was making sure I was having fantastic & memorable shots in Snake Island. 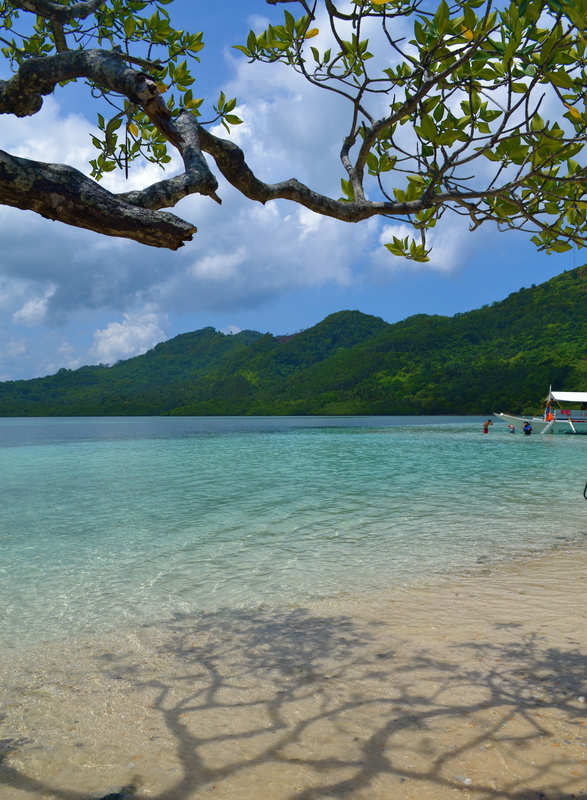 Our next destination would be Cudugnon Island. 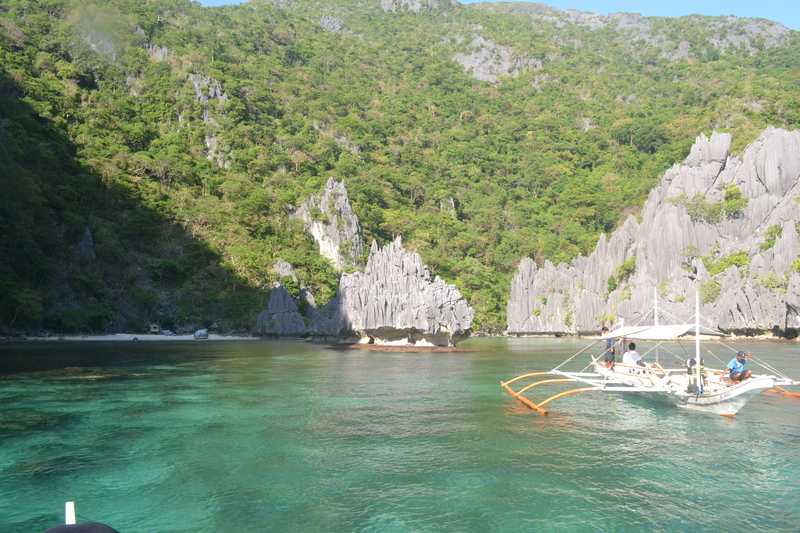 I have always been mesmerized by island approaches most especially if the waters are as stunning as the one we saw as we were about to dock in Cudugnon Island. 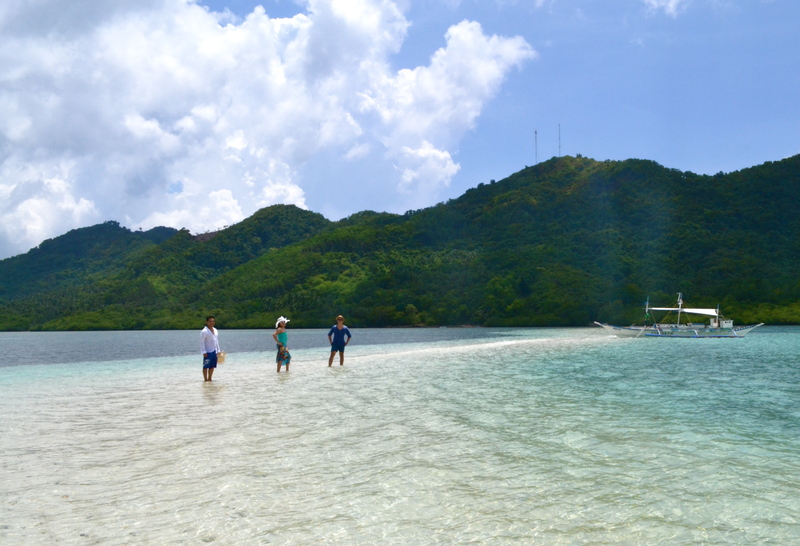 The island has a short stretch of white sand beach. 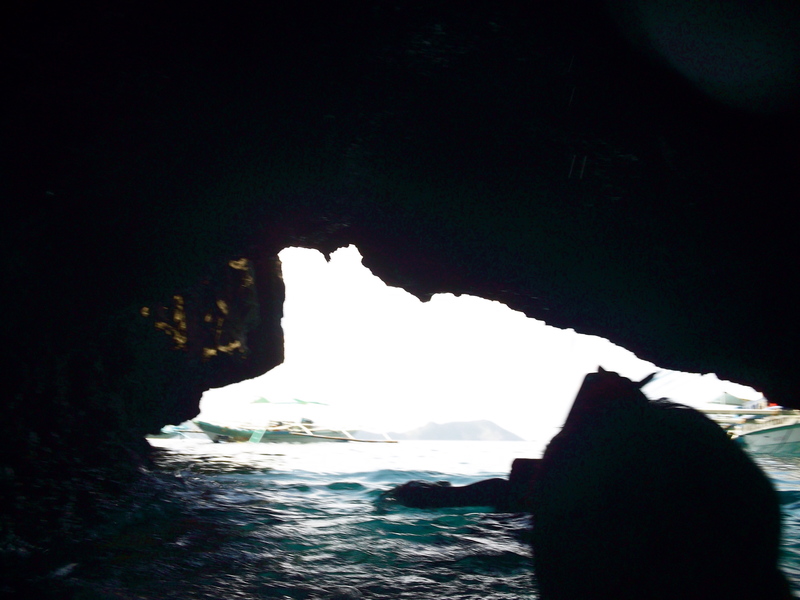 This was not the highlight but…..
…a cave with a very small opening that one has to crawl to get inside. I am not fascinated by caves so it was just a normal, boring sight for me except that it was the first time I saw a cave with an opening directly above it. 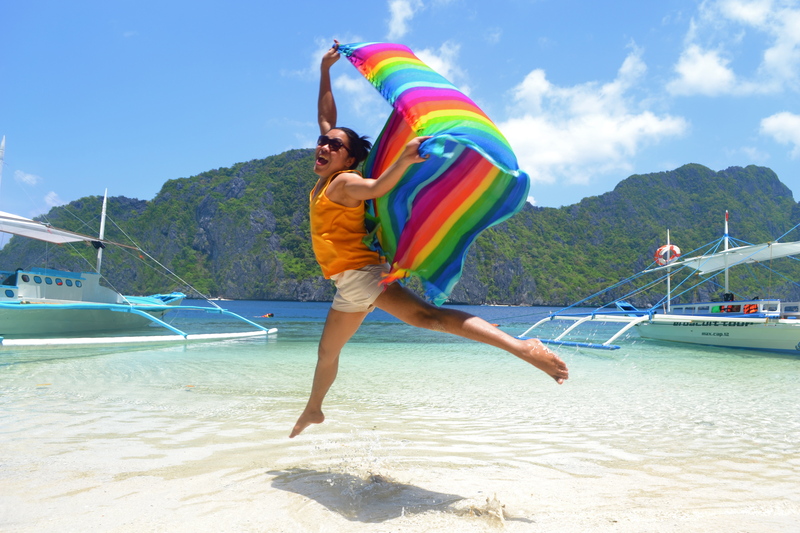 I could have just lazed on the island’s wonderful white sand beach but we had to leave soon for our next destinations on a full packed day in El Nido. 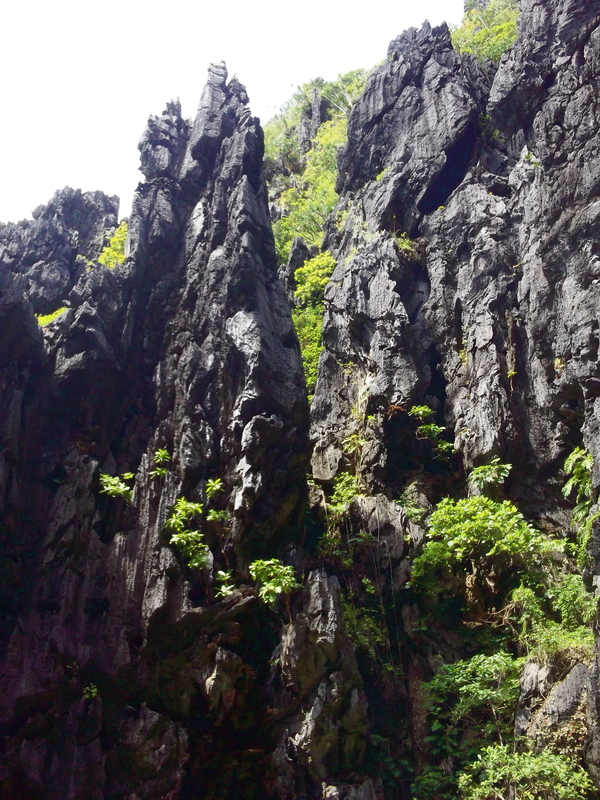 We headed west to see another spectacular natural wonder, the Cathedral Cave. 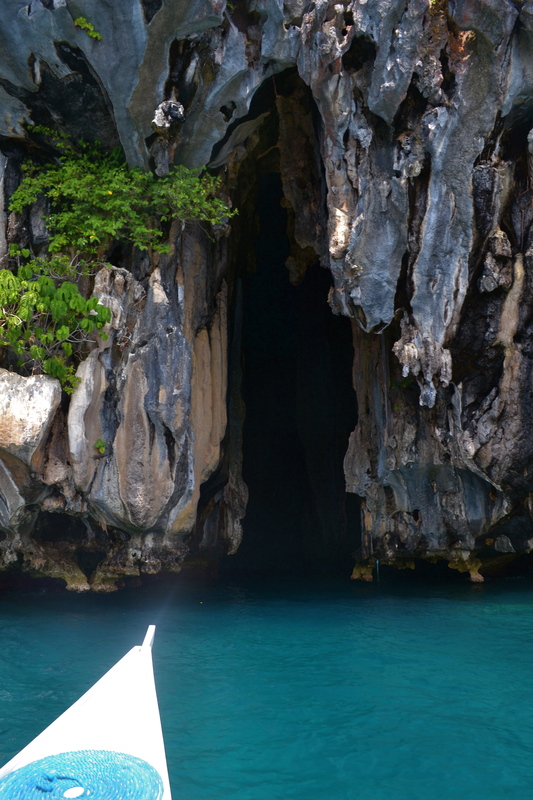 The entire island is actually a big cave with the openings resembling like entrances to a gothic cathedral. 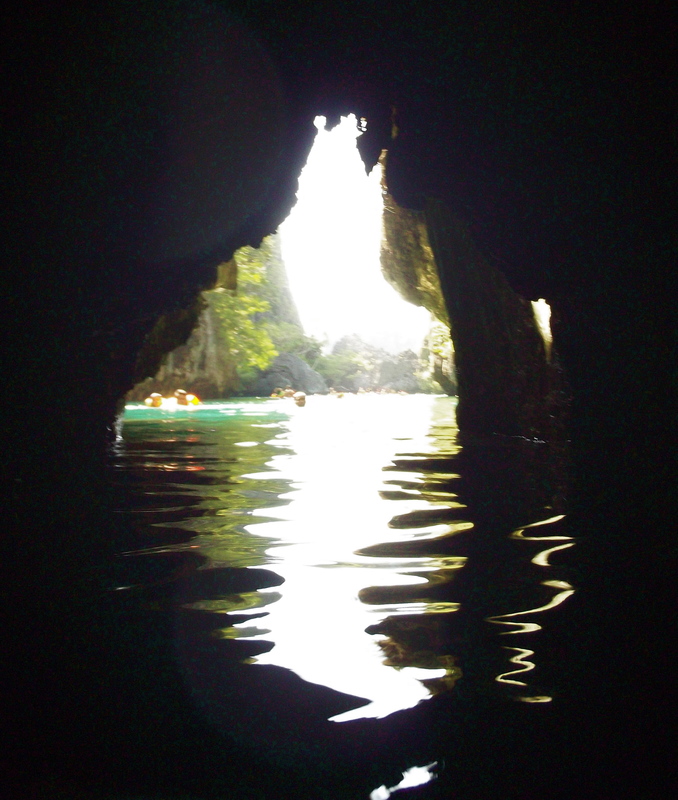 Regular boats could not get inside the cave because of its small openings so we just stayed on the boat and took pictures from outside. 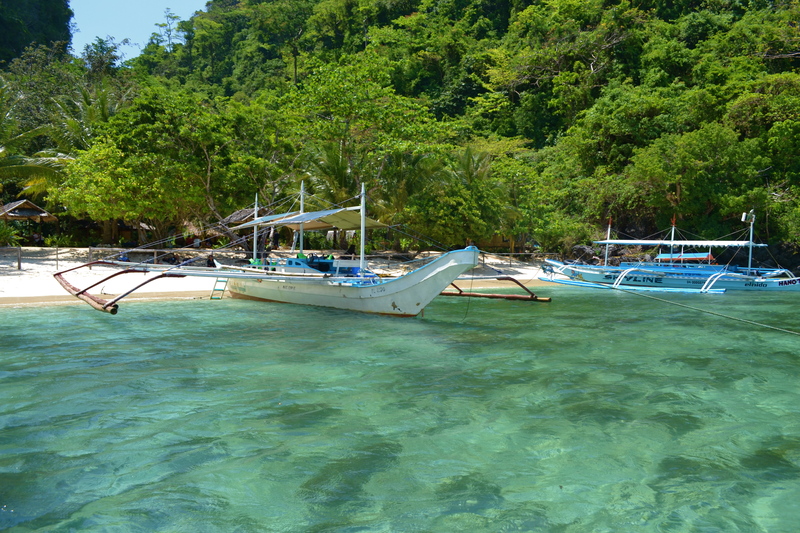 We headed west again and we stopped a while to snorkel off the shores of a private island called Lagen. 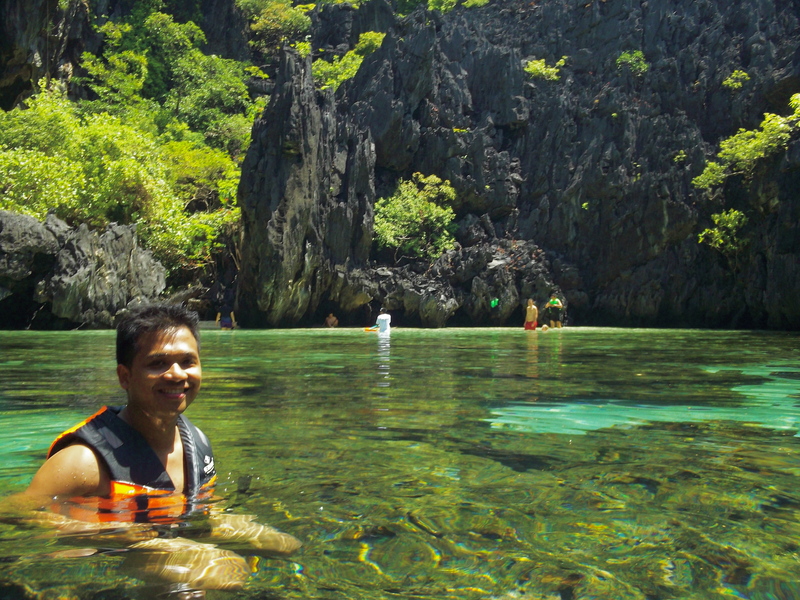 We were told not to go inland and just swim around the waters and enjoy the underwater scenery. We brought food for the fish and they all went out to feast on them. My favorite species in the area were the little blues I saw. 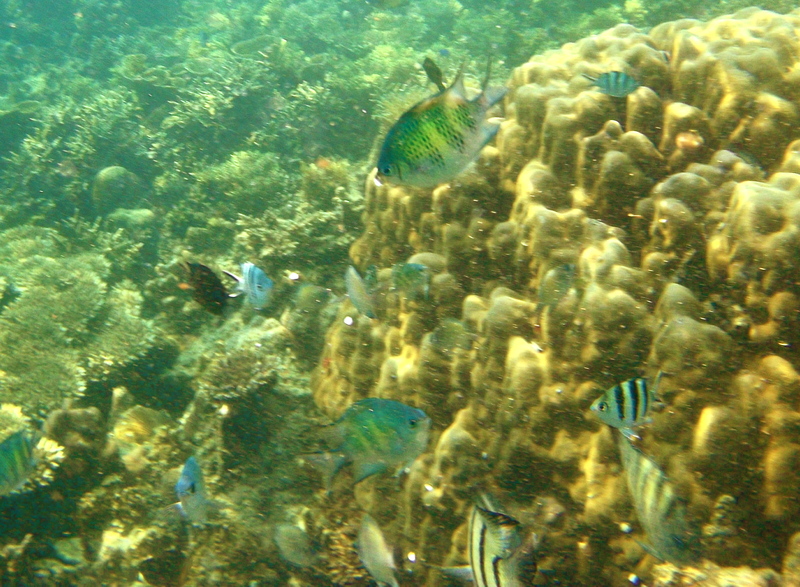 I just took a picture of them as they were just near the bottom of the sea and would not come up nearer the surface. 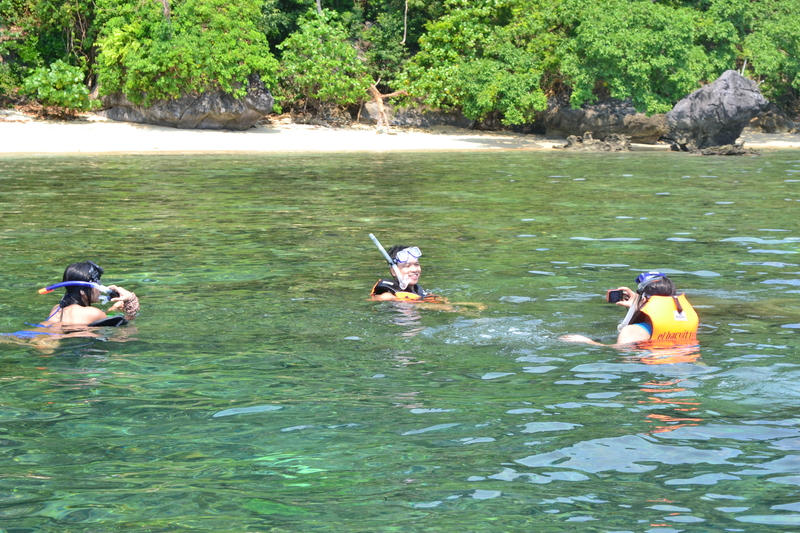 I am not yet an expert swimmer like my friend Raffy who enjoyed the sea life up close. I dared not dive, much more swim without a life vest. 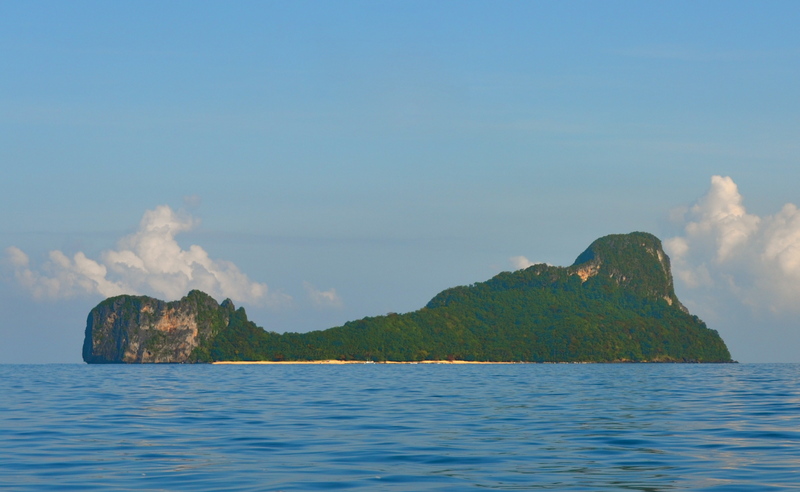 After snorkeling we continued to head south and we passed by the 3rd of the El Nido Resorts which is situated in the island of Lagen. 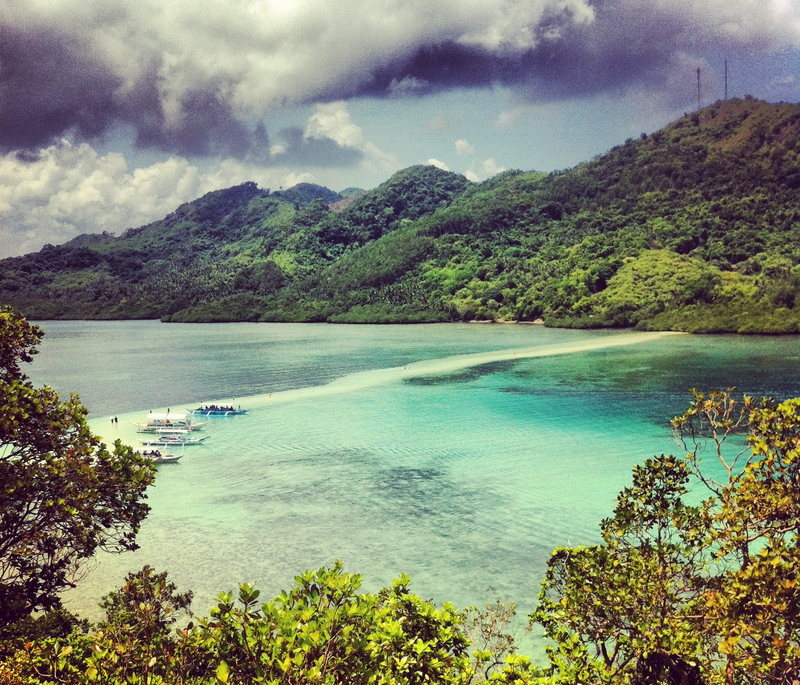 El Nido Resort in Lagen Island is a bit cheaper than the one in Miniloc but still way expensive for the common people. And on we continued to head south. 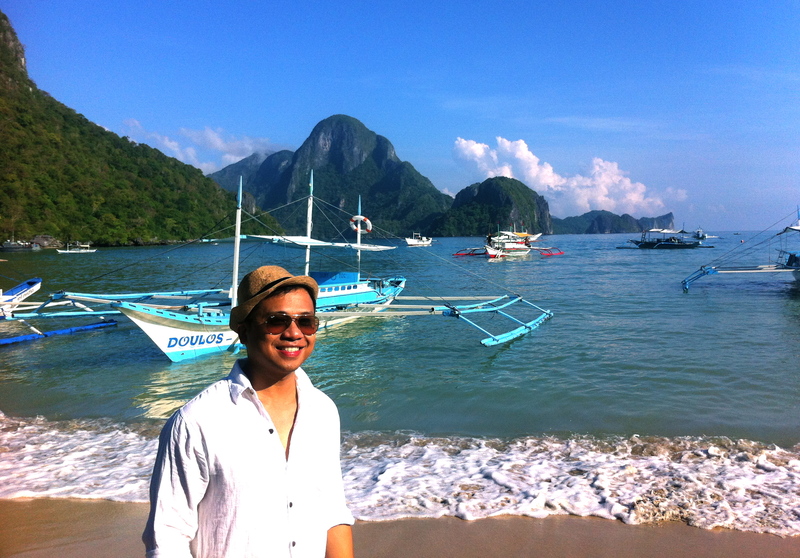 Approaching Pinagbuyutan Island was the most memorable experience for me on that day. 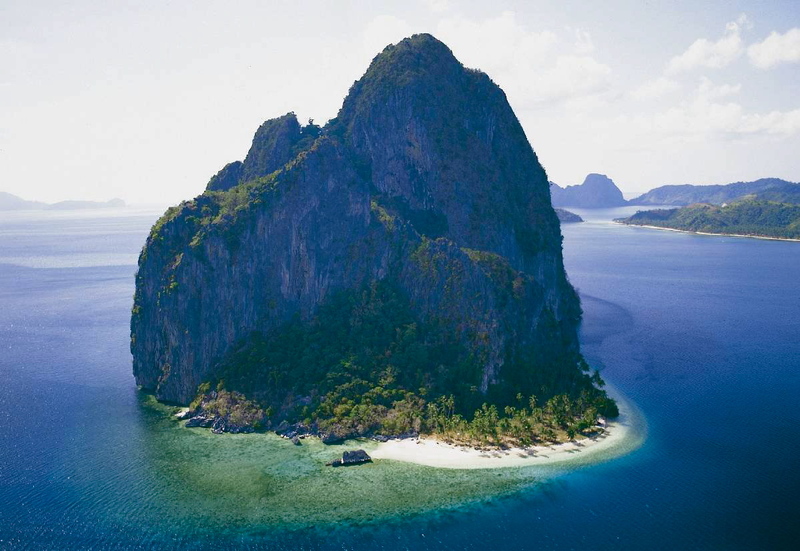 The island would become my favorite island in El Nido’s Bacuit Bay and would remain the island of desire for me as it was off limits to visitors that time as it was being used by Survivor Sweden. 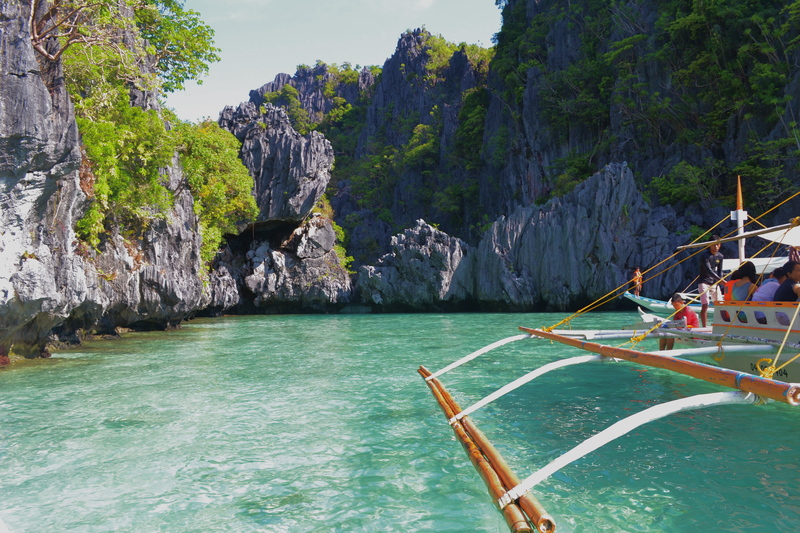 Should I blame the producers of the Survivor series why they like the Philippine islands so much from Caramoan to Palawan? Here, I am showing a top view of the island which I definitely did not take. 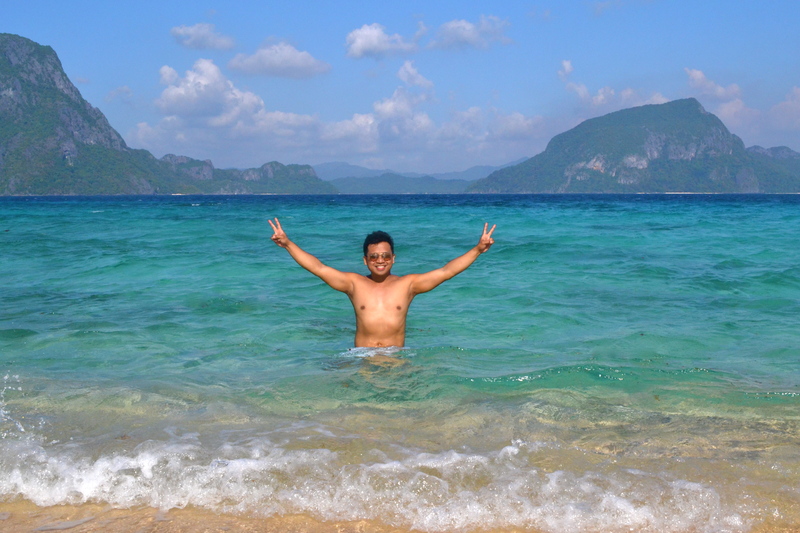 Yes, Pinagbuyutan Island would just be in my mind for now until the next time I would visit El Nido in 2013. Passing by the western side of the island it was indeed paradise desired. I got close snapshots (well not very close actually) of the contestants of the famous TV series. 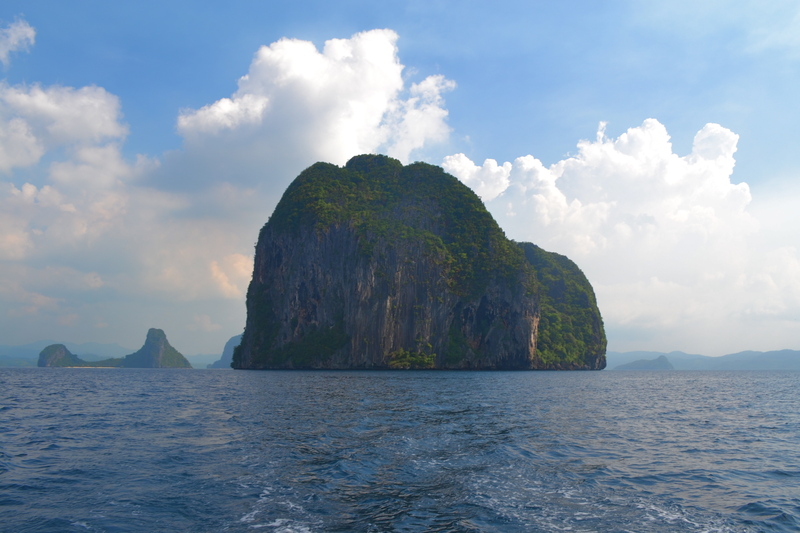 The personal frenzy died down as we completely passed by the island and we could only see it from its back. 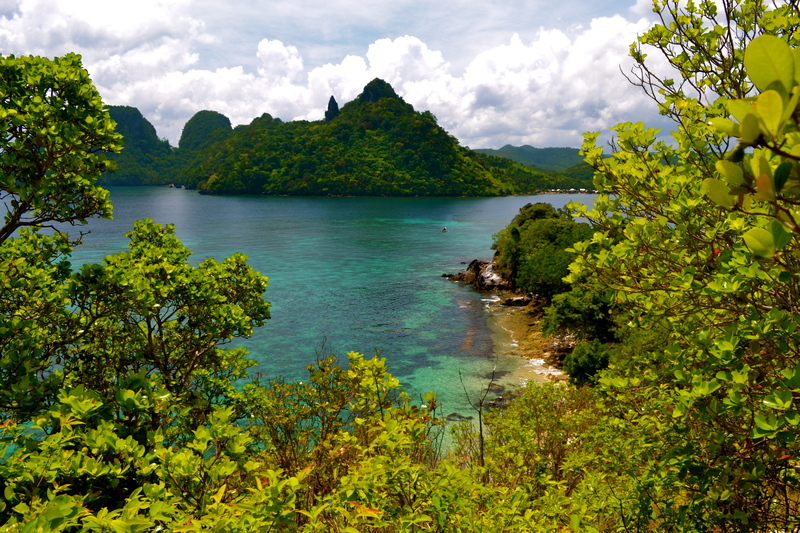 Our attention shifted to the last destination for the day, Seven Commandos Island. This is the usual last stop for the day tours and it gets pretty crowded before dusk. 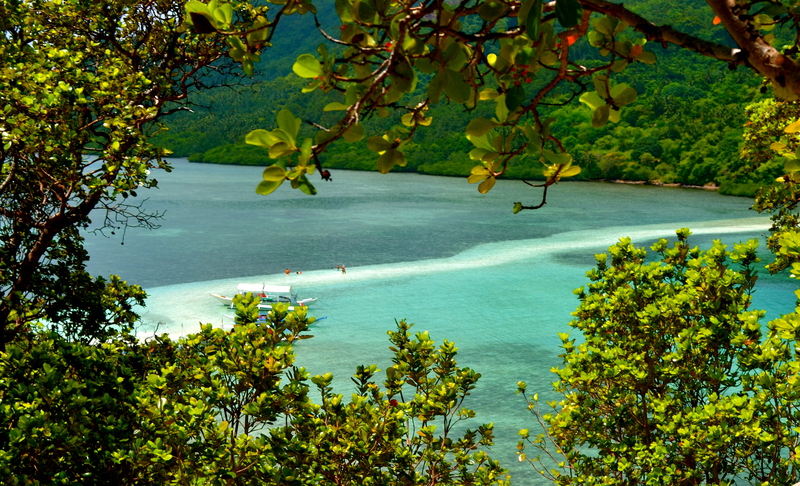 The beach has a high slope that gives an unobstructed view of most of Bacuit Bay. 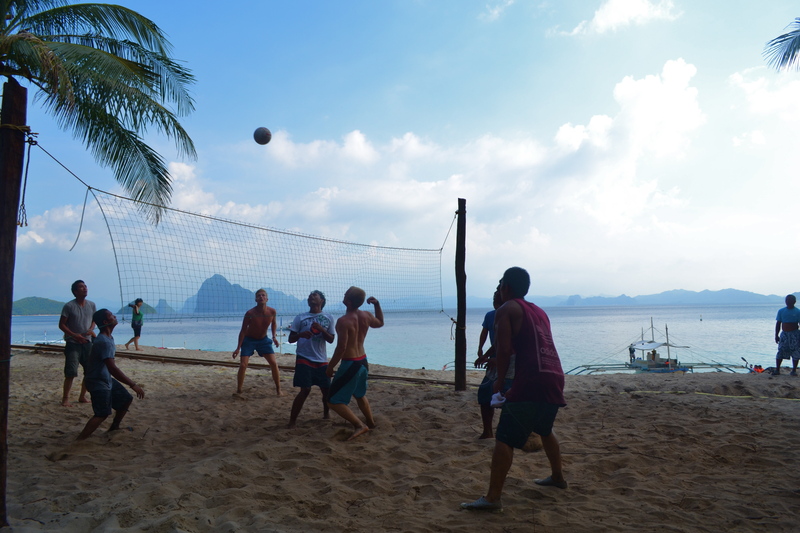 The most famous activity on this island is beach volleyball played by local and foreign visitors alike. One could cap the day enjoying one, two or three bottles of great tasting local beers. 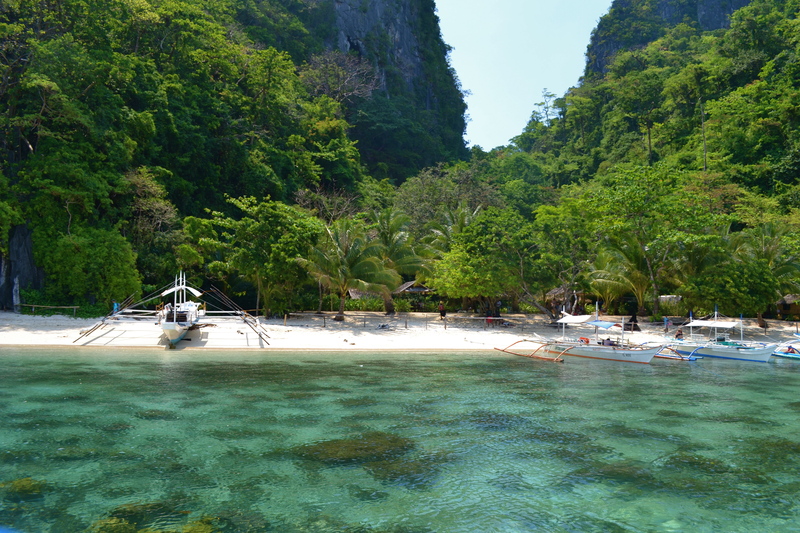 Indeed after touring El Nido for a day I would definitely say it a crown jewel of Philippine tourism with its diverse natural attractions…..and we were just halfway through the fun and sights of El Nido. 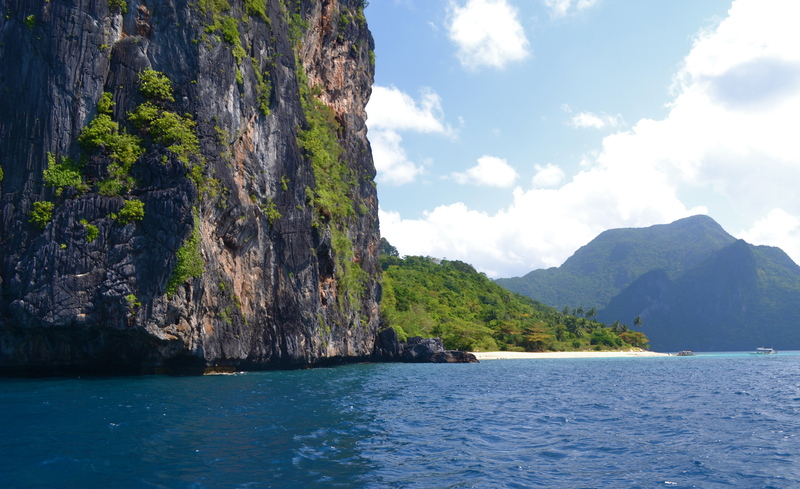 The next day we would be visiting more amazing sites such as the Secret Beach, said to be the inspiration of Alex Garland’s The Beach, Helicopter Island, Matinloc Island and of course, Cadlao Island. 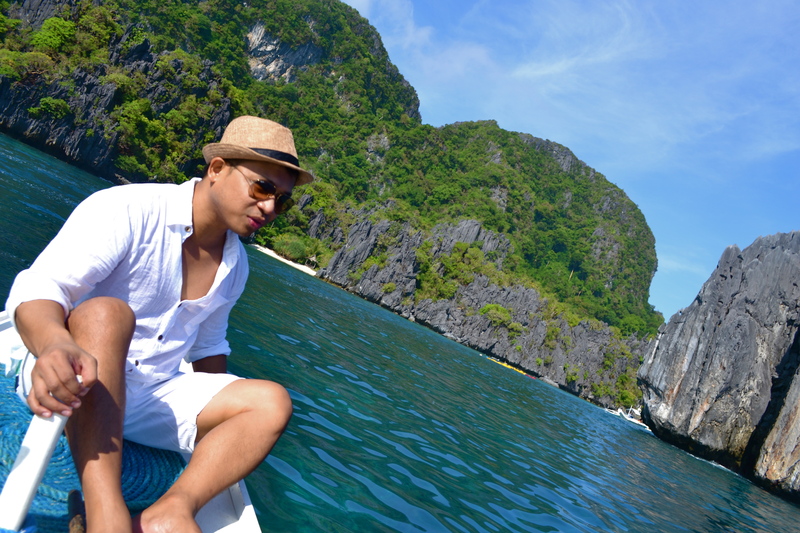 We left El Nido town at 830am on our way to the famed Secret Beach. 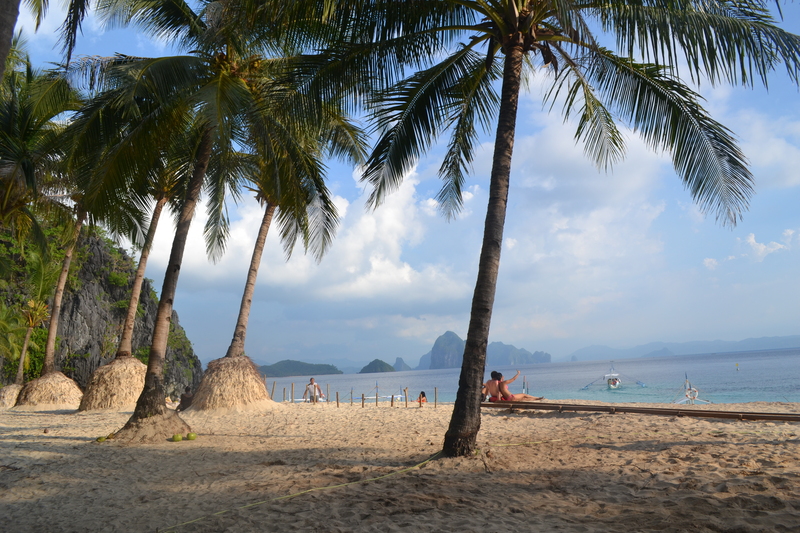 The usual sceneries of El Nido such as white sand beaches…. 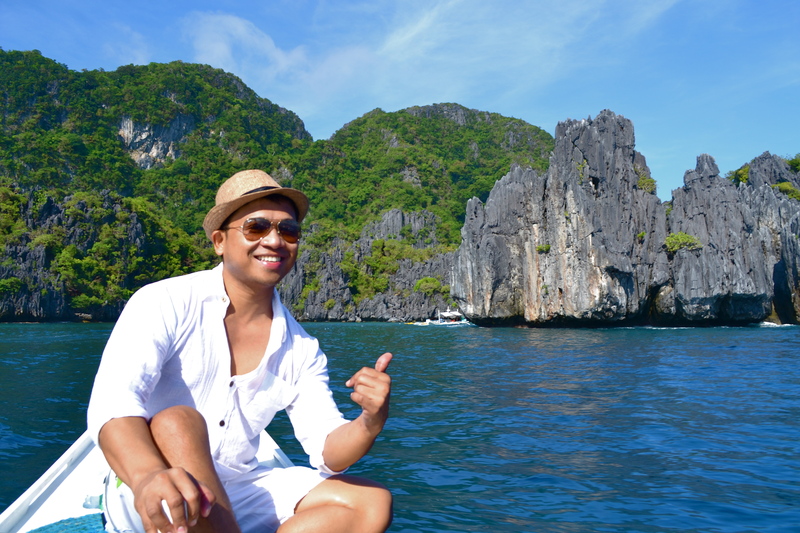 ….and limestone formations caught our attention again. 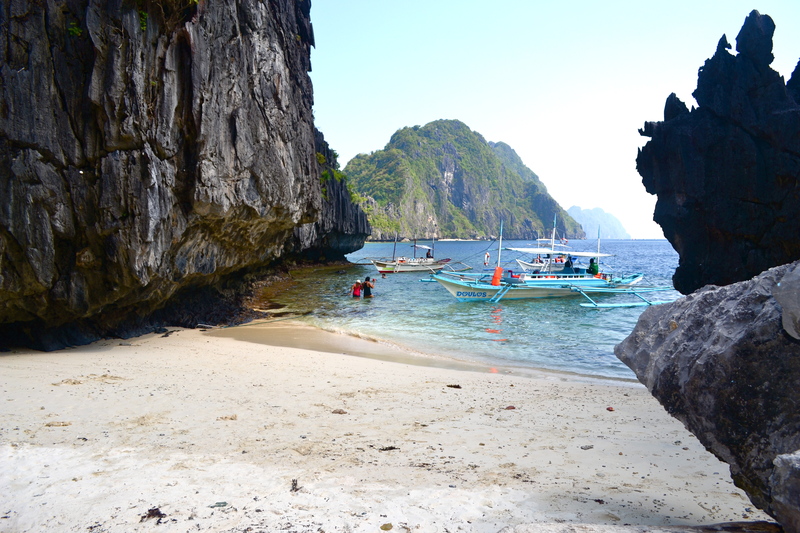 Our first destination was the Secret Beach. 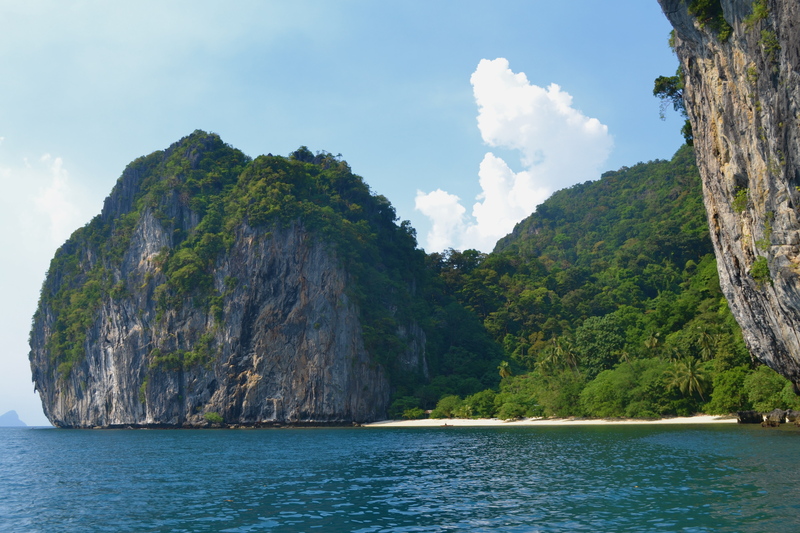 This is said to be the inspiration of Alex Garland’s book, The Beach, which was made into a movie and was shot in Thailand with Leonardo Decaprio as the lead star. 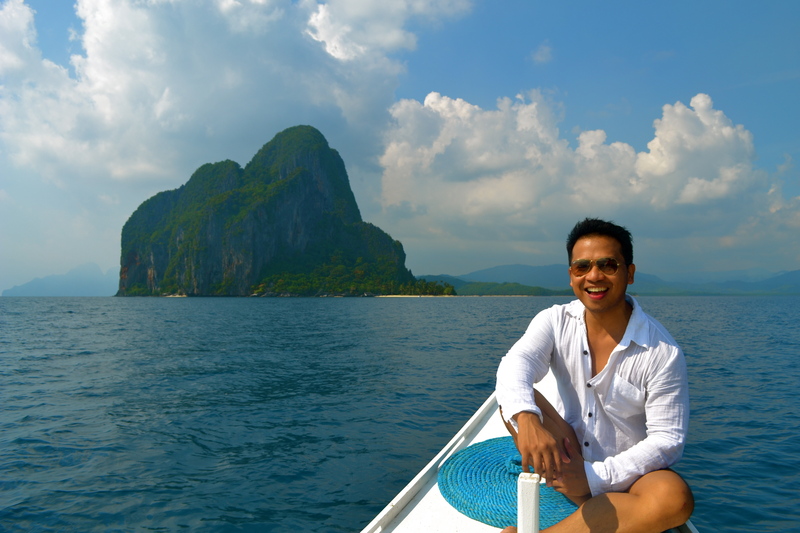 Alex visited El Nido years ago and was captivated by the “secret” beach. 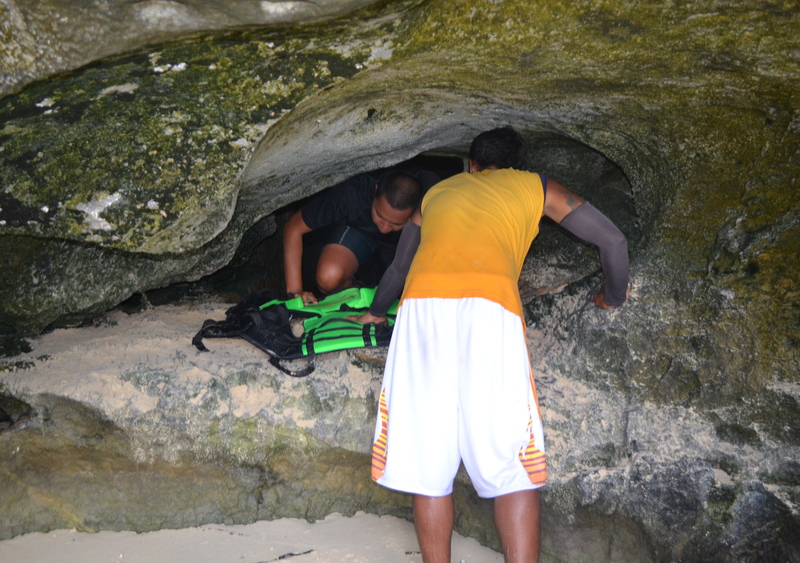 Indeed, it would have been a secret until after some locals found the beach by entering the small opening beneath the towering limestone formations in this part of Matinloc Island. 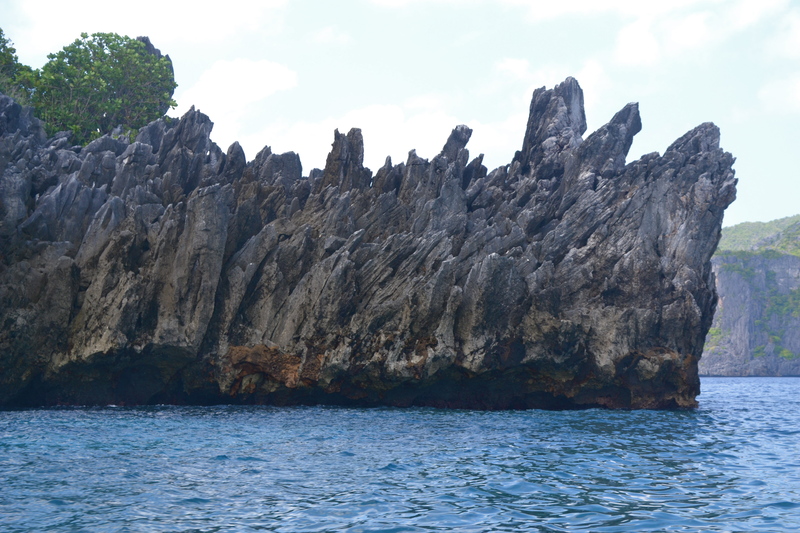 The small opening can be hazardous during monsoon season as the waves could pound you to the sides of sharp rocks. 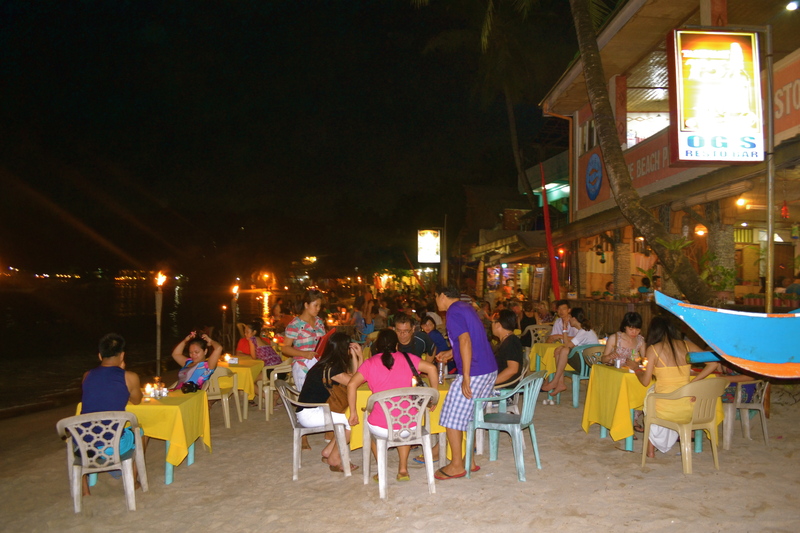 Since it was summer time when we visited the place, we easily got inside the beach area with ease. Please click here to see how the grand entrance would be like. I took the video using my underwater camera. 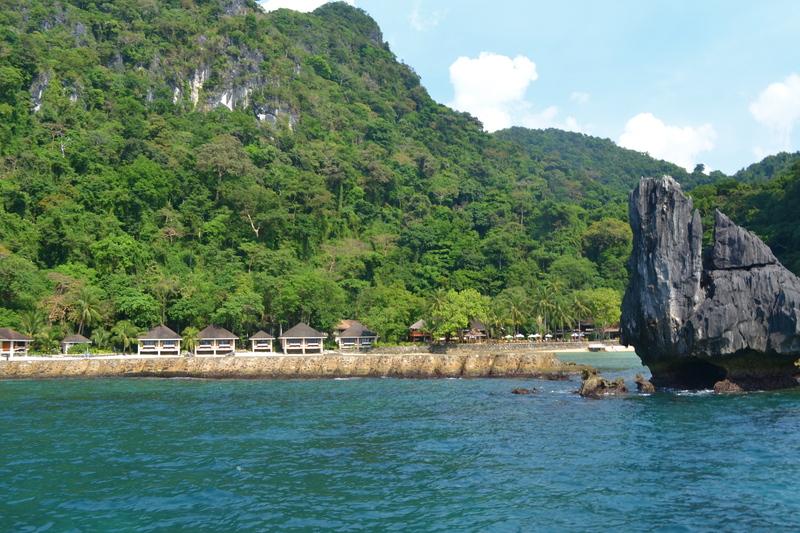 This was the entrance to Secret Beach as viewed from inside the beach area. 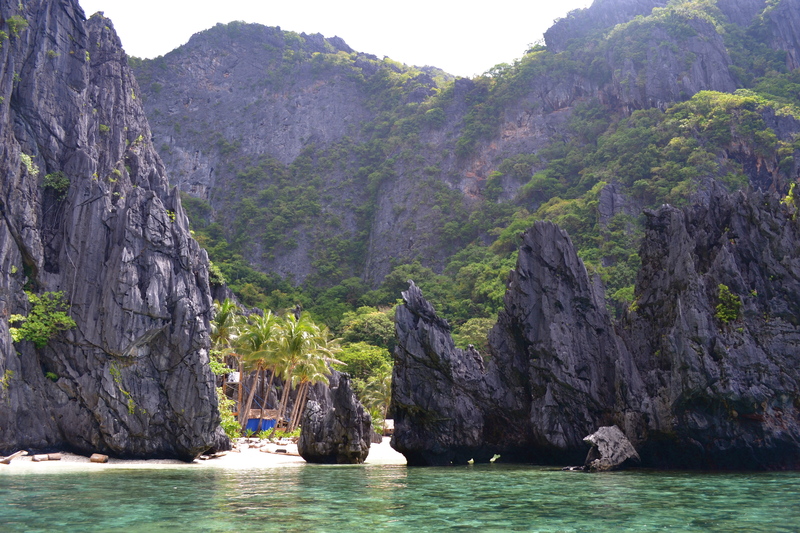 A place of perfect seclusion and calmness, this was the first view I got of the Secret Beach as we entered the area. I needed to have that coveted snapshot, didn’t I? 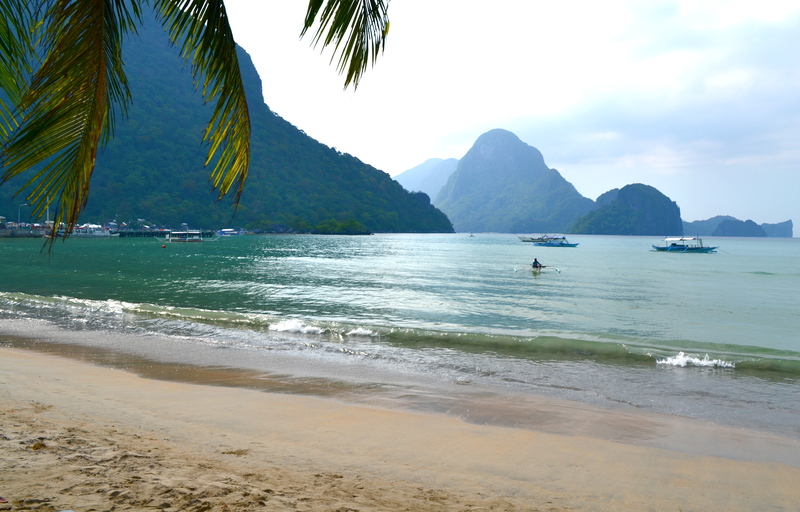 Now this is the view from the beach itself. 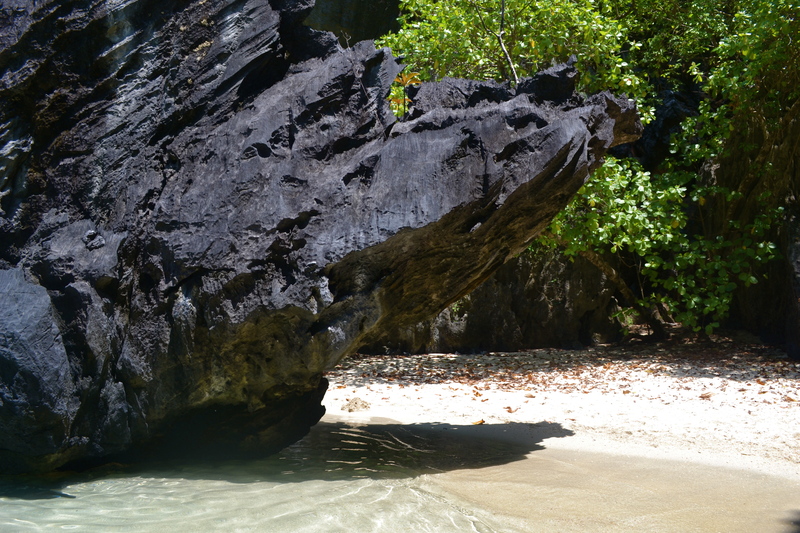 Still, some rock formations try to hide the white sand beach. 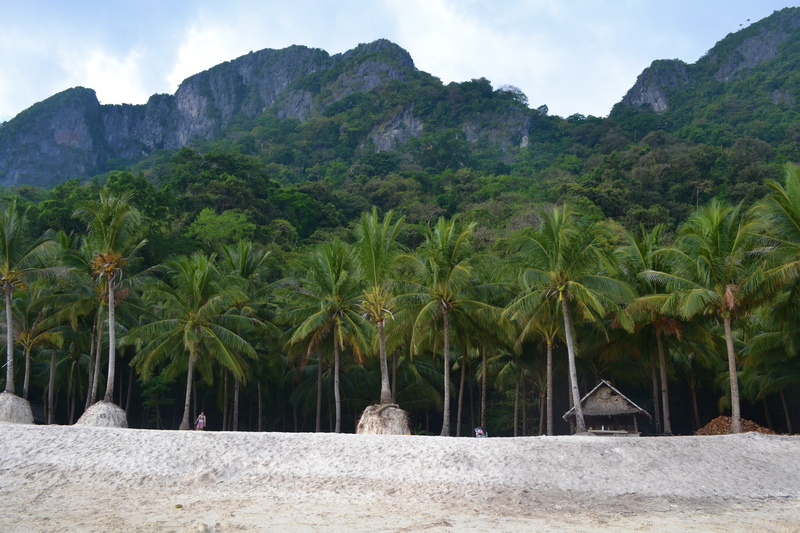 This was the view from the beach and on the right side was the entrance where we came from. 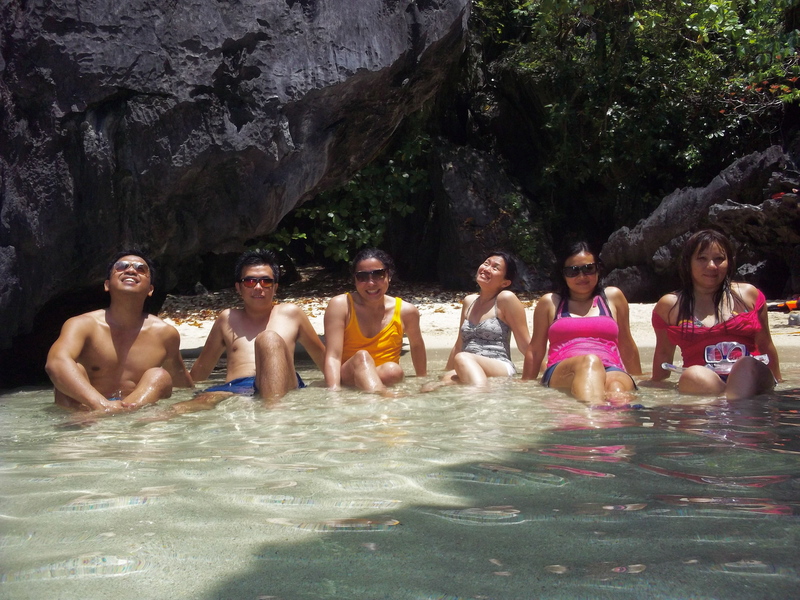 A group shot on the “secret” beach was inevitable. 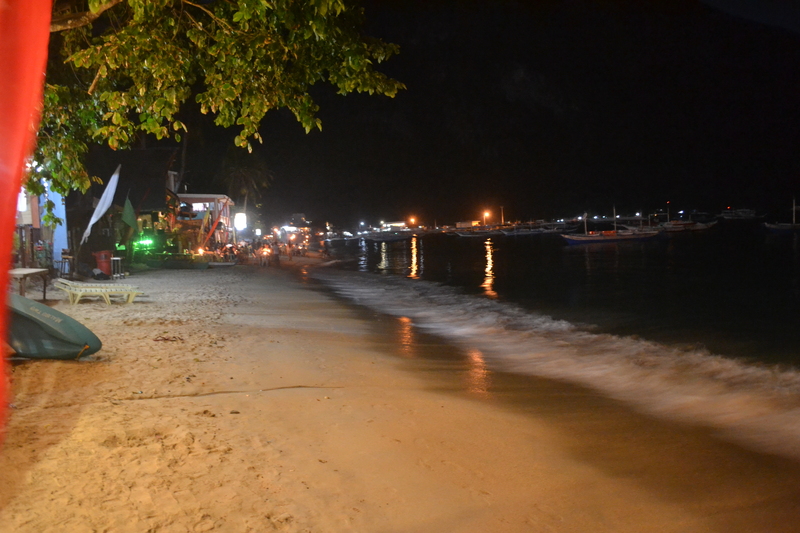 Another shot of the beach. 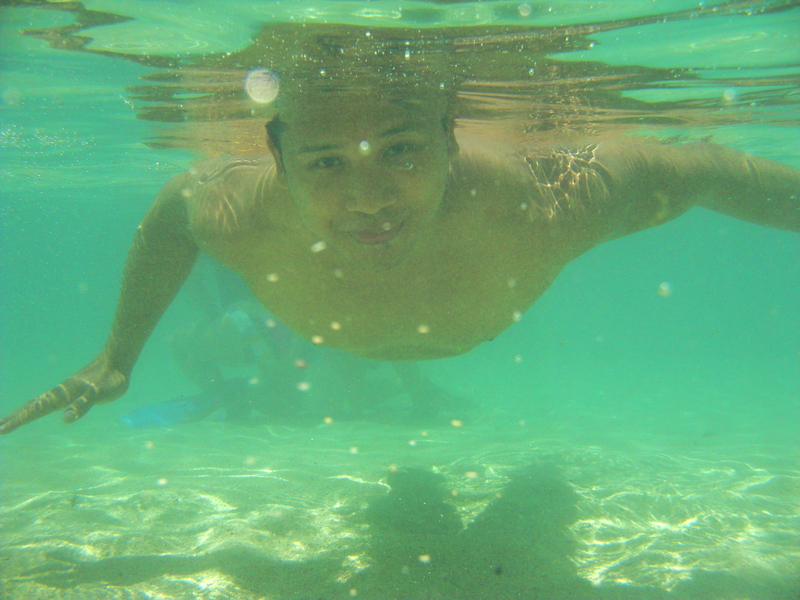 It was already high tide so most parts of the beach was under water…..
…water that was so captivatingly clear. I did not want to leave the place but we had to! It was indeed an overwhelming experience. If I had the choice to cancel the itineraries for the entire day just to spend time here, I would have rightfully done so. 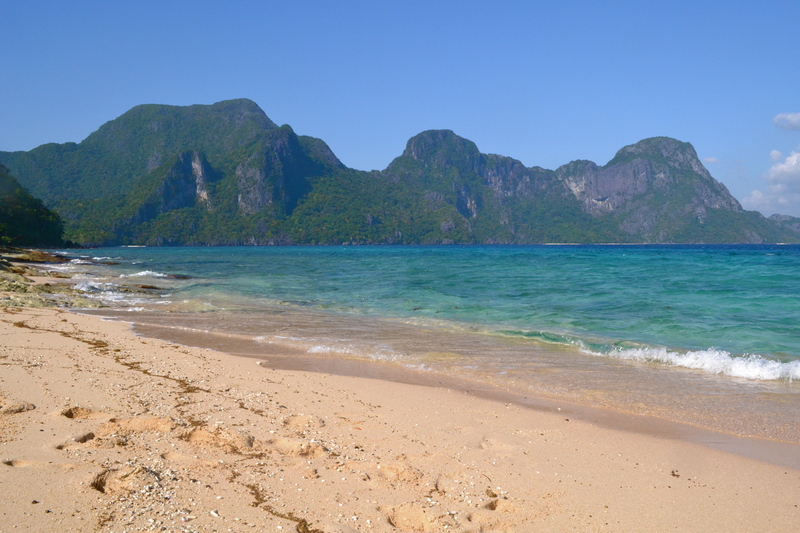 Next stop: Talisay Beach. 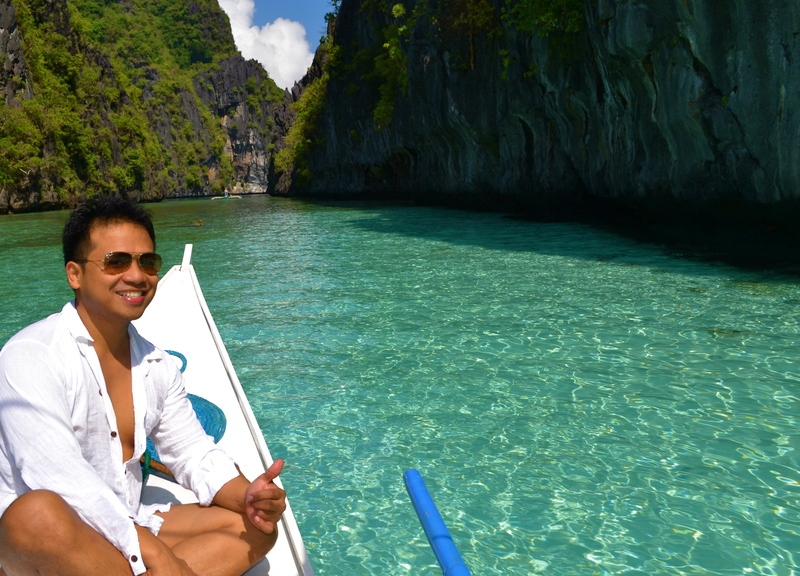 The approach to the beach was stunning with crystal clear waters fascinating me again. 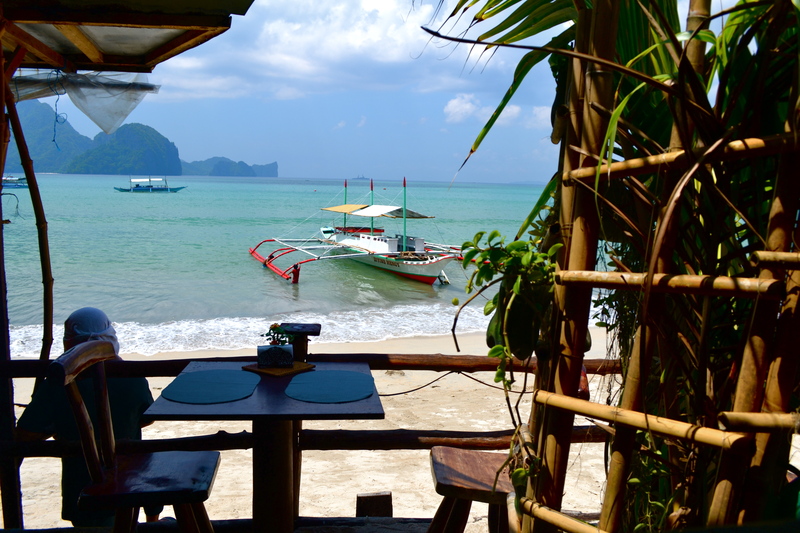 With a short strip of white sand beach we would stop here for about almost 2 hours…. 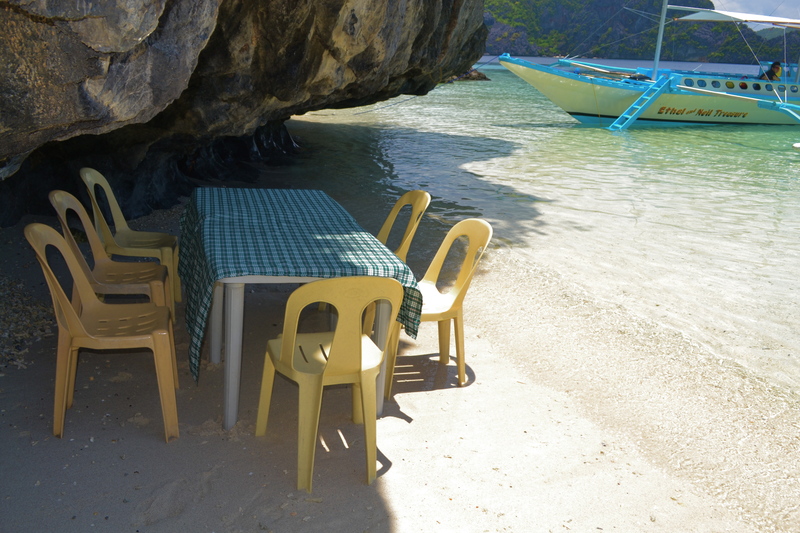 …to have lunch by the beach side. 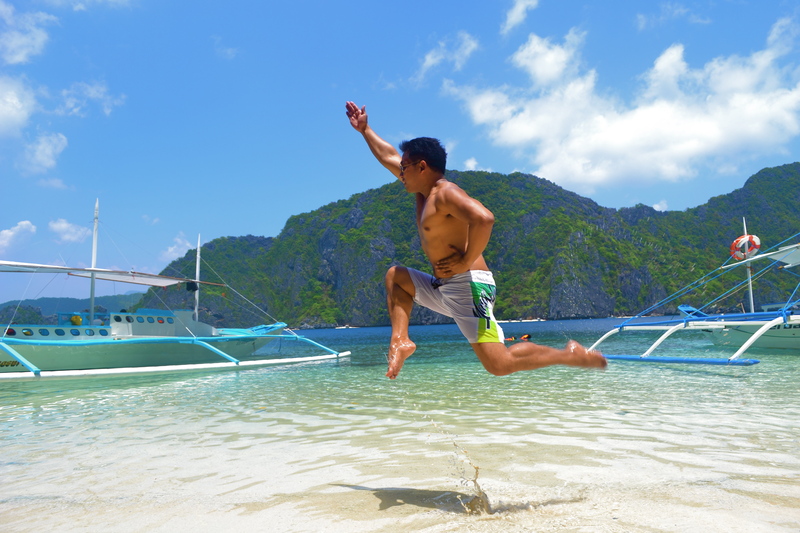 As we waited for the boatmen to prepare our food, some went to swim and snorkel around the area…..
…while we took pictures on the boat…. ..and up in the air! We had fun and then we were exhausted. Finally our food was served. 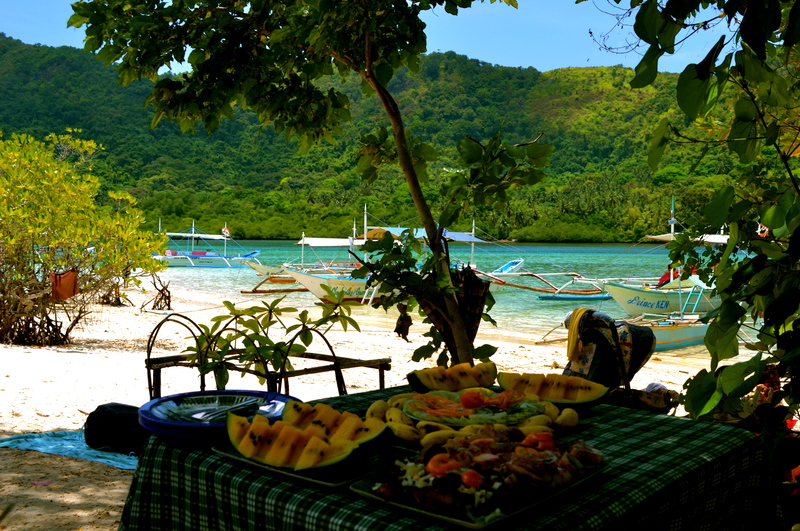 We left Talisay Beach 30 minutes after we were done munching on the healthy and sumptuous food. 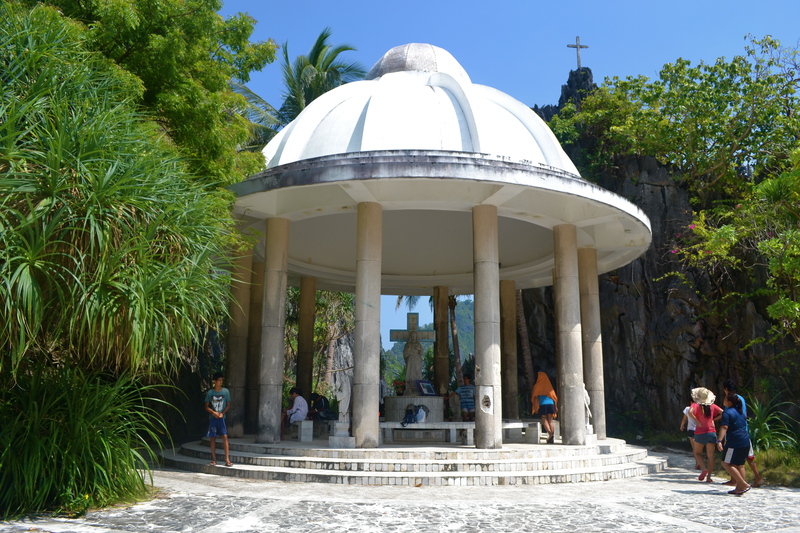 Just around Talisay Beach, on the same island of Matinloc, we stopped to see the Matinloc Shrine. We did not focus much on the Catholic Shrine but instead we went directly to the…. We still managed to get a group picture before everyone went their own ways to explore the shrine area. 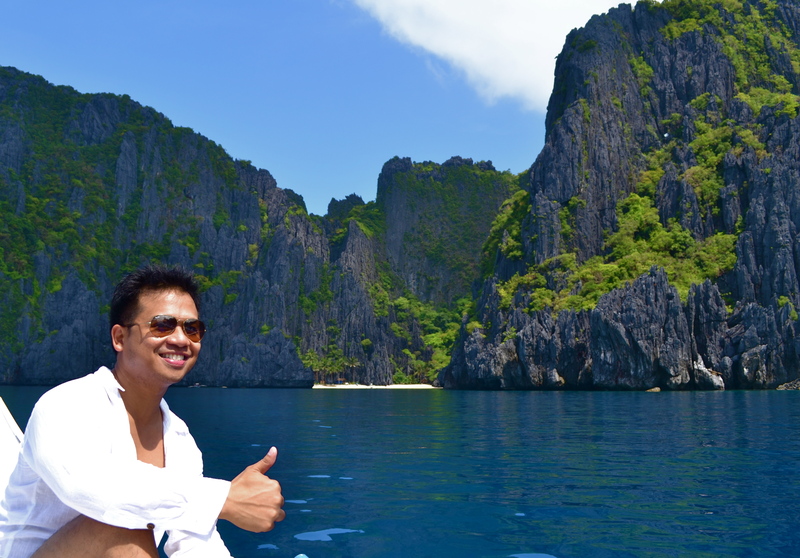 At the edge of the docking area are karst formations and all, this is El Nido! 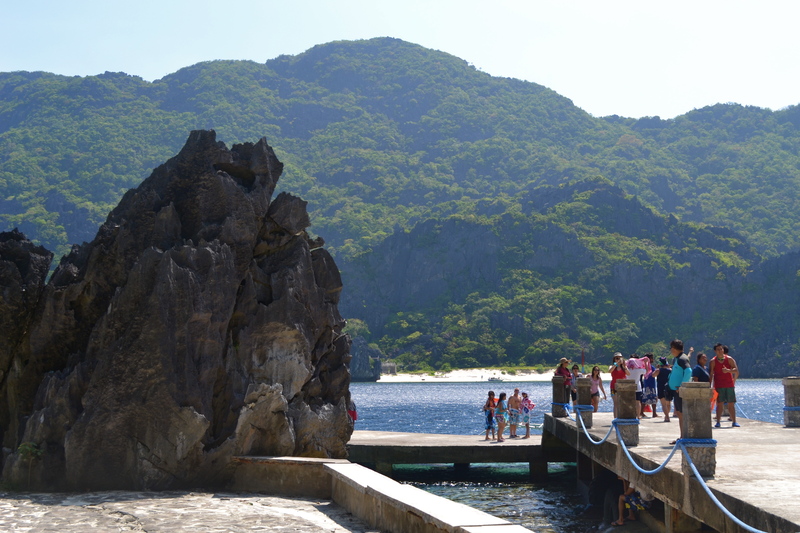 Still in the shrine area, a steep cemented stairs led up to a vantage point that has incredible views of the bay and the neighboring islands. We pushed ourselves up and our efforts were not wasted. It was a sight to behold. We went down a few minutes later to take the almost one hour trip to another interesting destination. Our next destination would be Helicopter Island. It was called as such because it looks like a half submerged chopper. I fell in love with the beach. There are finer and whiter sand that I could find somewhere else but this beach has a certain alluring character that I could not explain. One reason could be the wide shore the beach has. 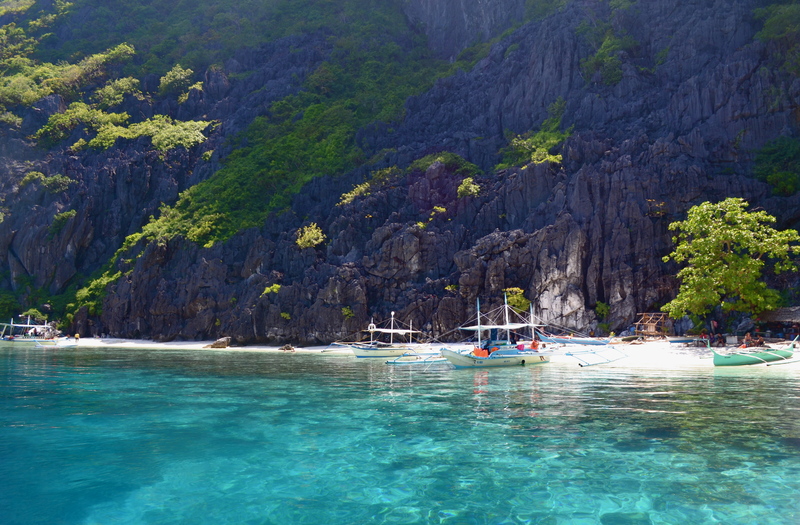 Probably another reason could be the clear celurian waters surrounding the island. 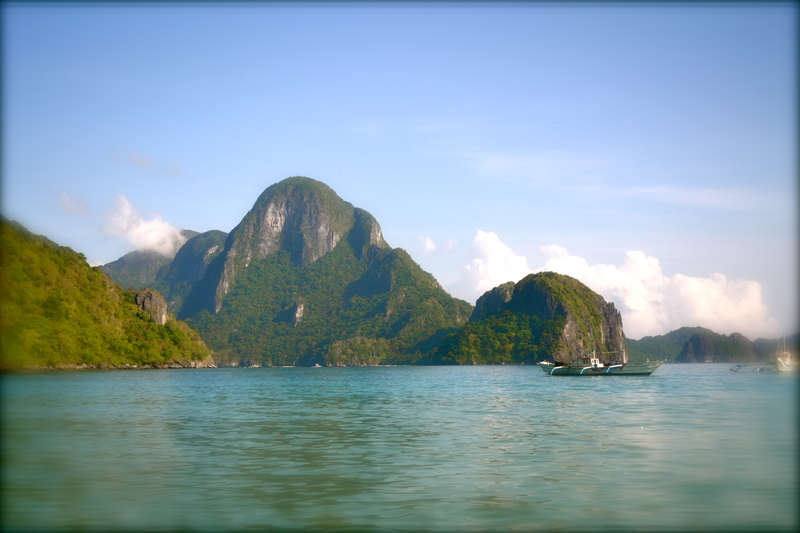 Another reason is the stunning view of Bacuit Bay especially the rugged topography of its neigboring Cadlao Island. We posed for that iconic summer group shot. The main event of the island visit was the pictorial flirting of our friend, Queen Thannya, with two hunky French men who were equally stunned by the beach. 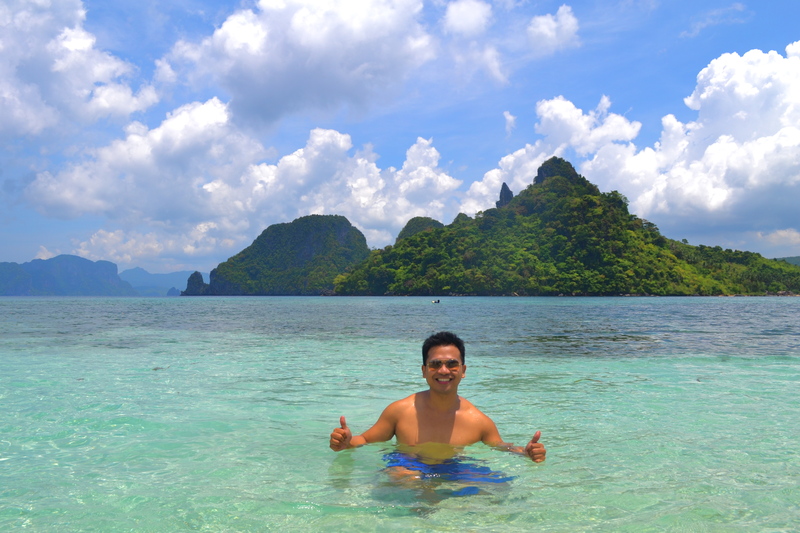 If Pinagbuyutan Island became my favorite island in Bacuit Bay, then the beach in Helicopter Island became my favorite beach. 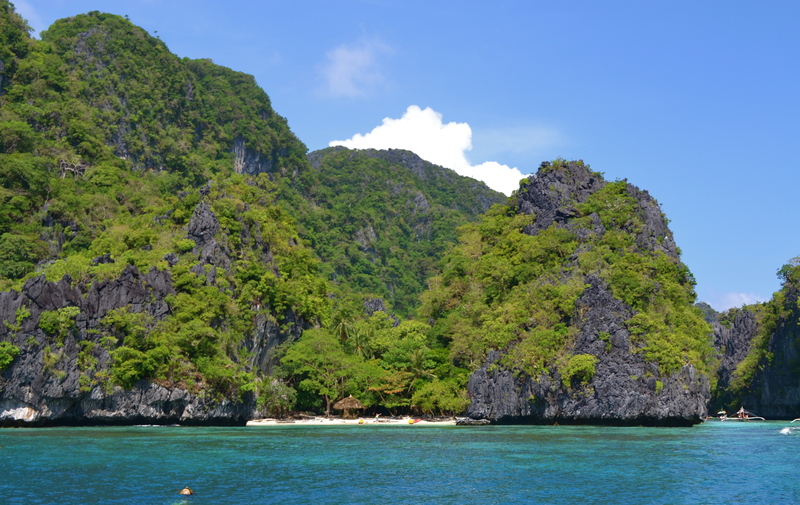 Our last destination would be the mystical Cadlao Island. 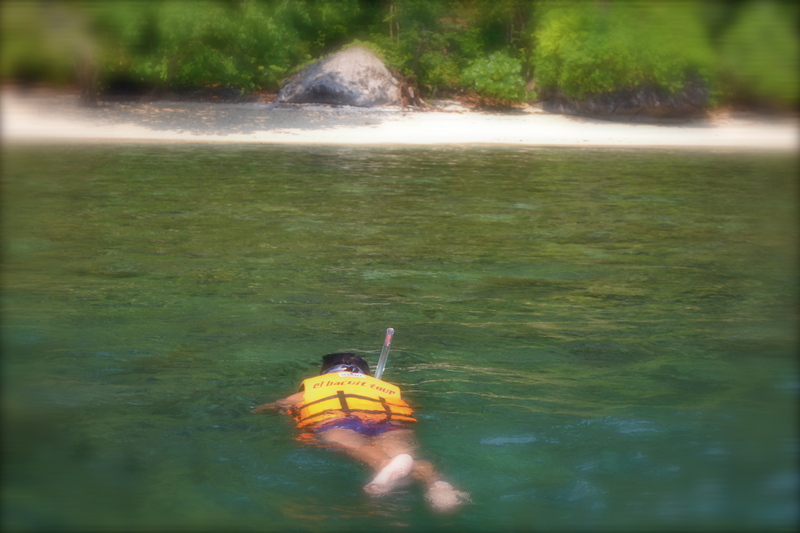 The activity options would be to snorkel and swim to the white sand beach. 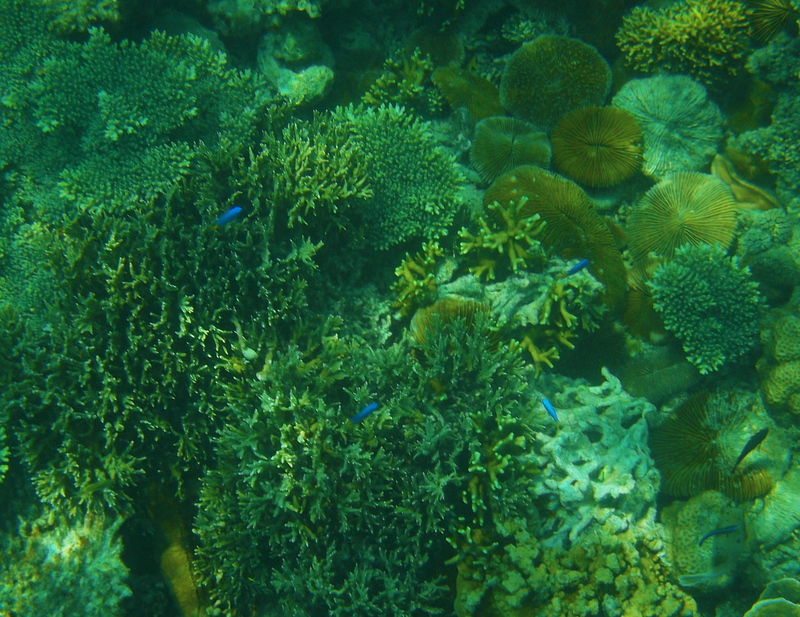 We could not dock nearer to the beach because the area is so shallow with a lot of corals. Some went for that long swim to the beach. Some stayed around the boat diving and snorkeling in the pristine sea, so pristine that we chanced upon a sea turtle that played with us. 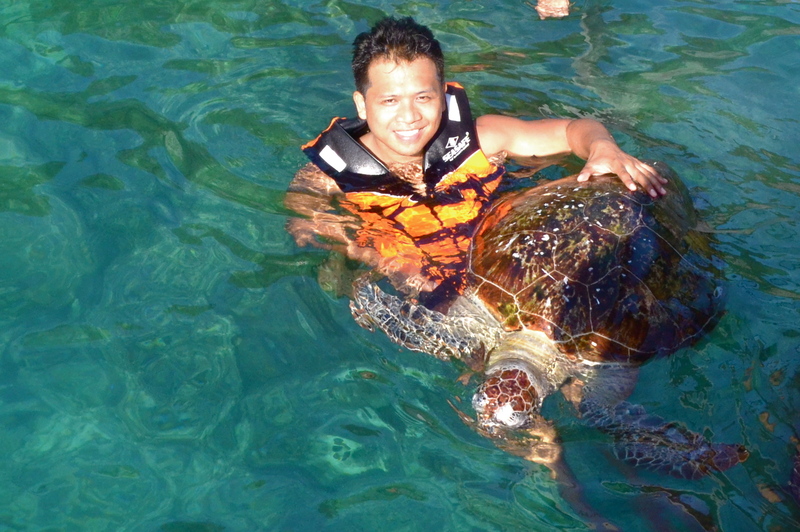 It was my first time to see up close a sea turtle that big! And then it was time to leave. That ended our tour combination of supposed to be four tours done in just two days. We did not have any regrets that we only had that much time. We were more than contented of what we saw and experienced. 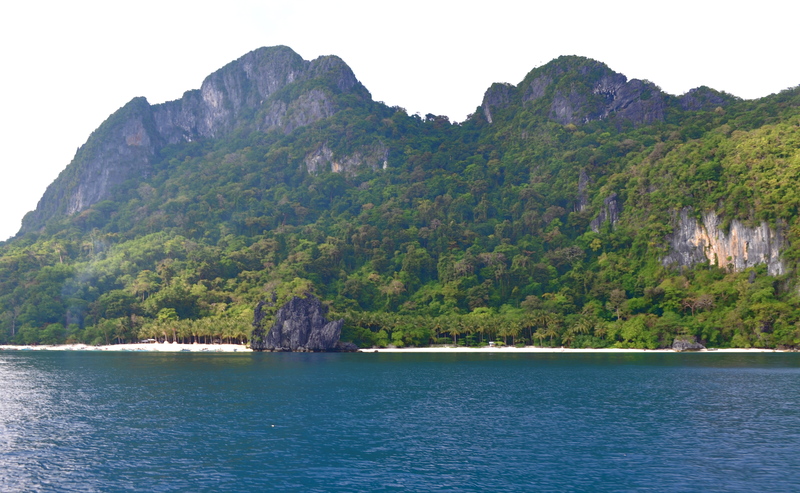 As we approached El Nido town in the mainland, the view of the mystical Cadlao Island was imprinted in our mind as the last famous icon of El Nido that we experienced. 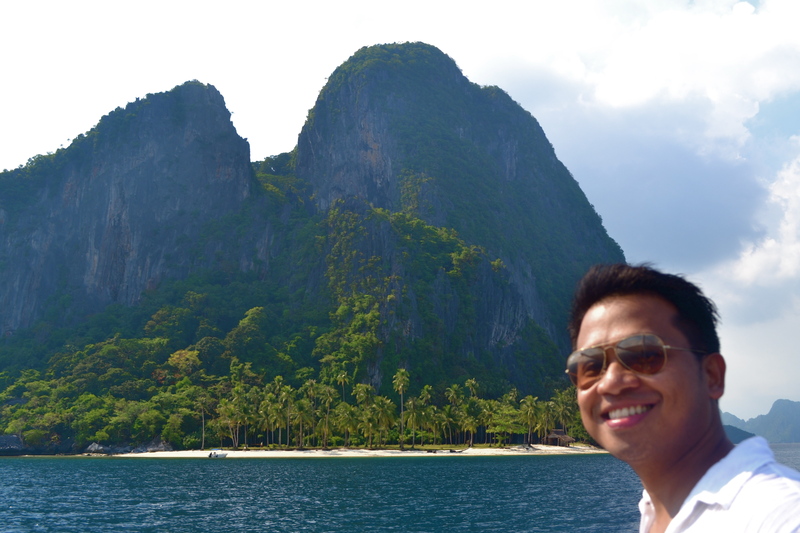 El Nido, see you again in 2013! Wow. 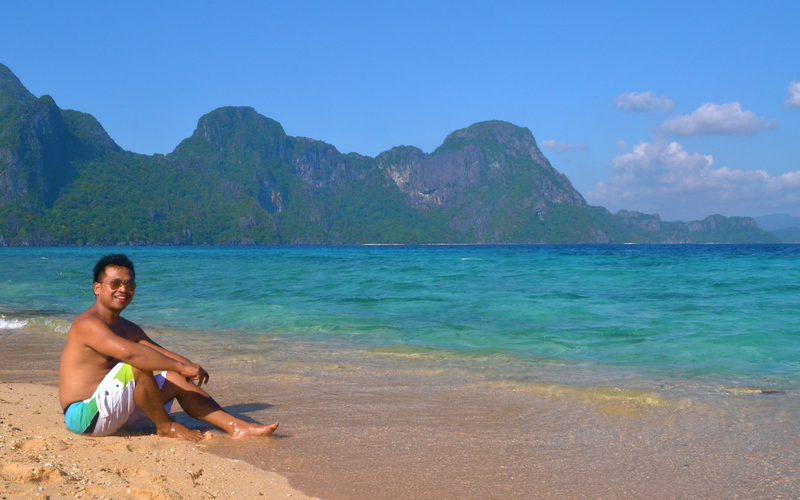 I think this is the most thorough post of El Nido I have stumbled into so far! Great place great trip! Very good material. Thanks for sharing!